I’ve finished sewing up a few more of the dresden plate blocks, I’ve got about 19 sewn together now and am still umming and ahhing about how I’m going to lay them out…. 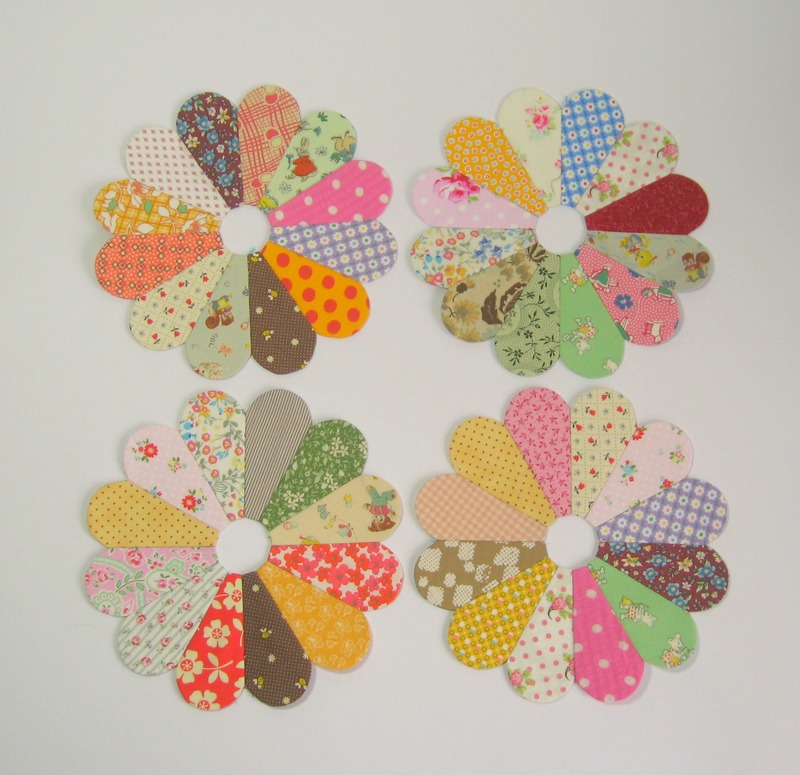 however I arrange them will really change how the quilt will look. I’ve cut out pieces for 25 plates and before I sew any more full plates together I really need to work out how I’m going to arrange the blocks. And I still haven’t properly decided what I’m going to do for the centres…. I kind of like Suffolk Puffs (being a Suffolk girl myself) think I’m going to need a bit of a play around to decide what works best. Making up my own quilts (especially making them up as I go along) is one of my favourite parts of quilting. 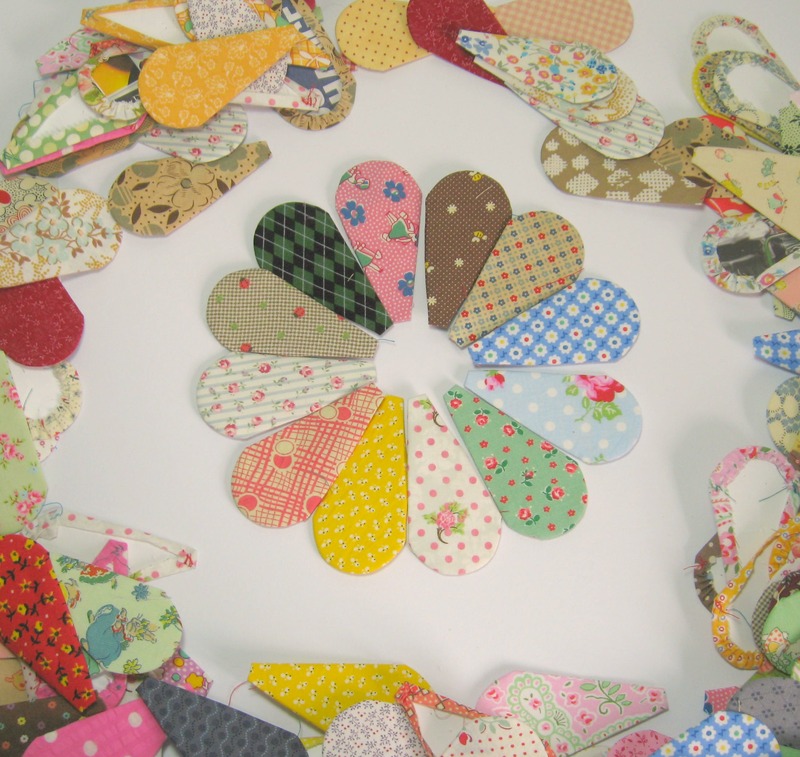 And at least if something is hand-sewn it’s way more easy to unpick a part you’re not happy with…..
On overcast days these patchwork plates are so nice to piece together. They make me feel like Summer really is just around the corner,which it is, but the weather keeps going gloomy and overcast so it’s very easy to forget which month we’re mow supposed to be in. The more I see these plates displayed like this the more I’d like to make up a whole load in different sizes to display on one of our walls…. not sure that the Arpette would really go for that though..
Back to the Classroom…… drafting a dresden plate….. I wanted to just explain how I drafted my dresden plate block. It’s not that difficult to do although you do need to be accurate with your pencil lines… you can buy dresden plate templates but I prefer to make my own and that way I have more control over how many segments my plate will have and also how big the plates will be. 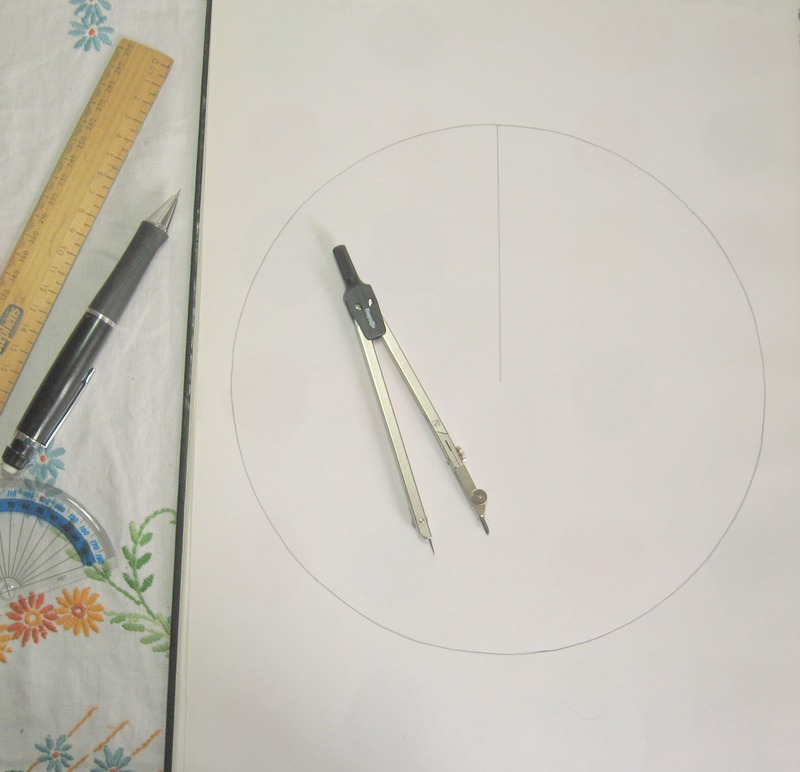 Draw a circle a little smaller than the size you would like your finished plate to be. 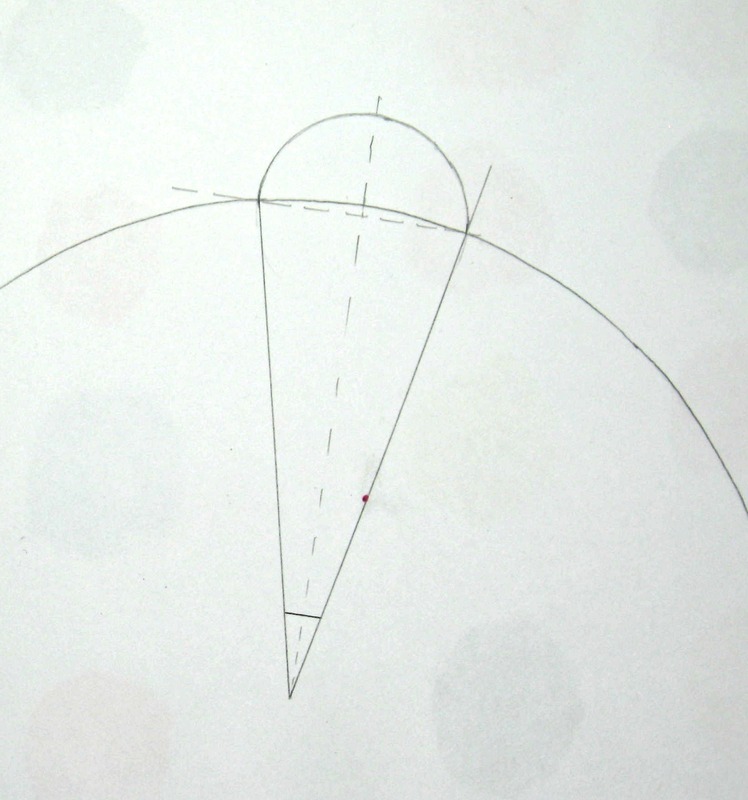 Draw a straight line running from the top edge down to the middle of the circle. 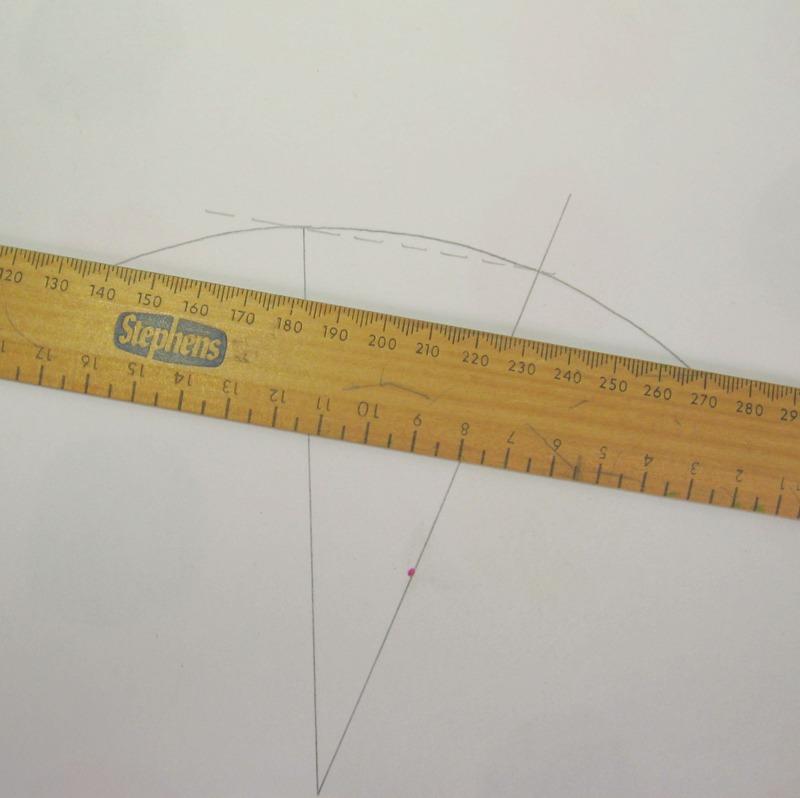 Carefully place the protractor along the line you have just drawn. 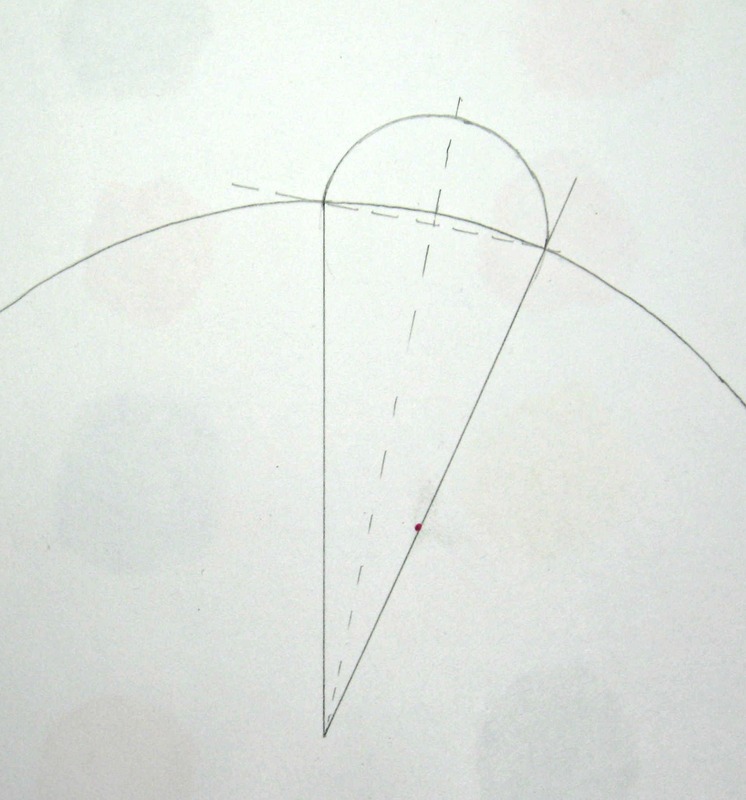 The cross at the bottom of the protractor needs to be placed directly over the centre of the circle, and “0 degrees” needs to be lined up with the downwards line you have drawn. Depending on how many segments you want in your plate, you will need to measure an amount of degrees. For this example I wanted the plate to be made from 15 segments…. 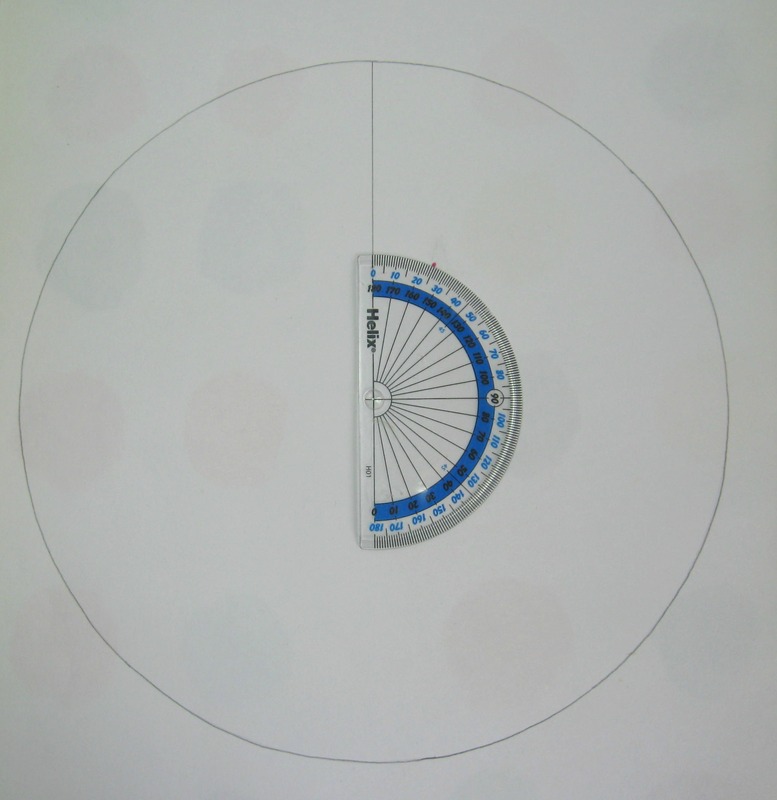 so you divide 360 (the degrees in a circle) by 15 (the segments in your plate)…… which gives you 24 degrees. 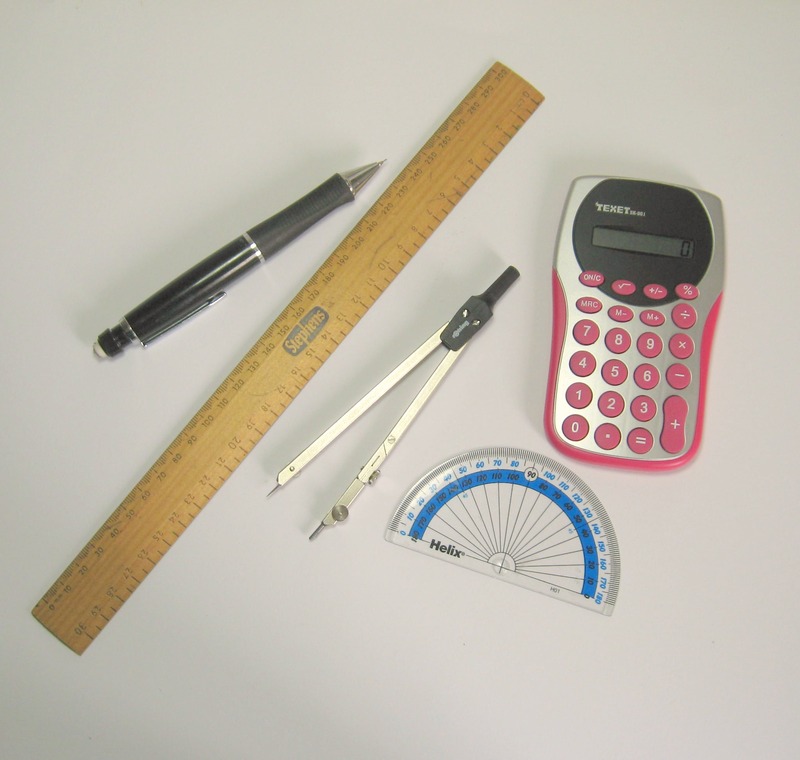 Carefully measure along the protractor 24 degrees and mark it. I’ve marked it with a pink dot so it is easier to see. 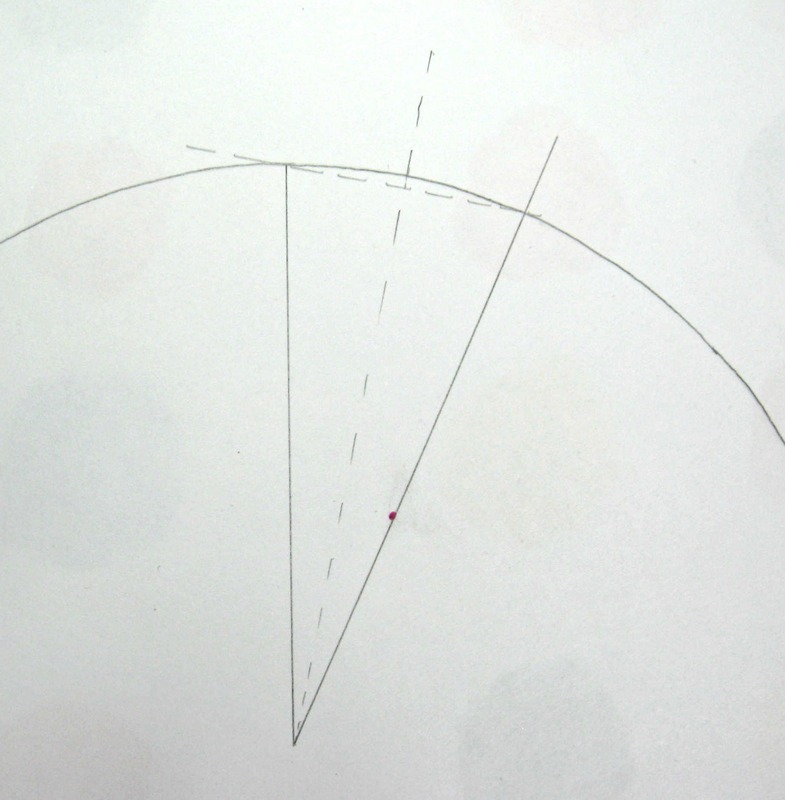 Place your ruler to the centre of the circle and the point of degree you are using…. carefully draw a line through both points. Using a 2h lead your line will be finer and more accurate. You now need to draw a line between where the two lines cross the circle. 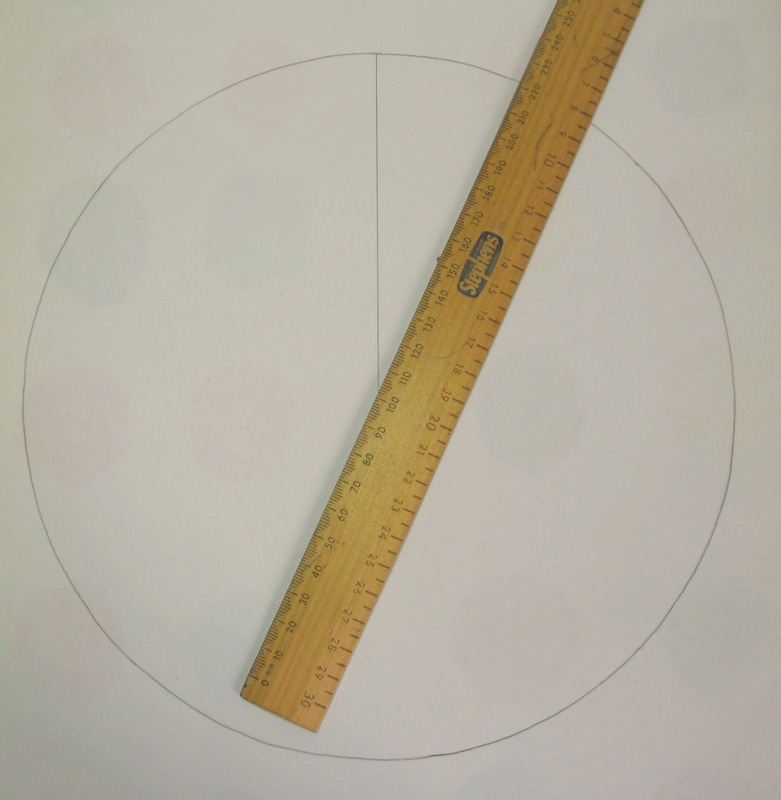 Measure as accurately as you can the distance and mark the centre point. Using this point, draw a line which divides your segment in half. 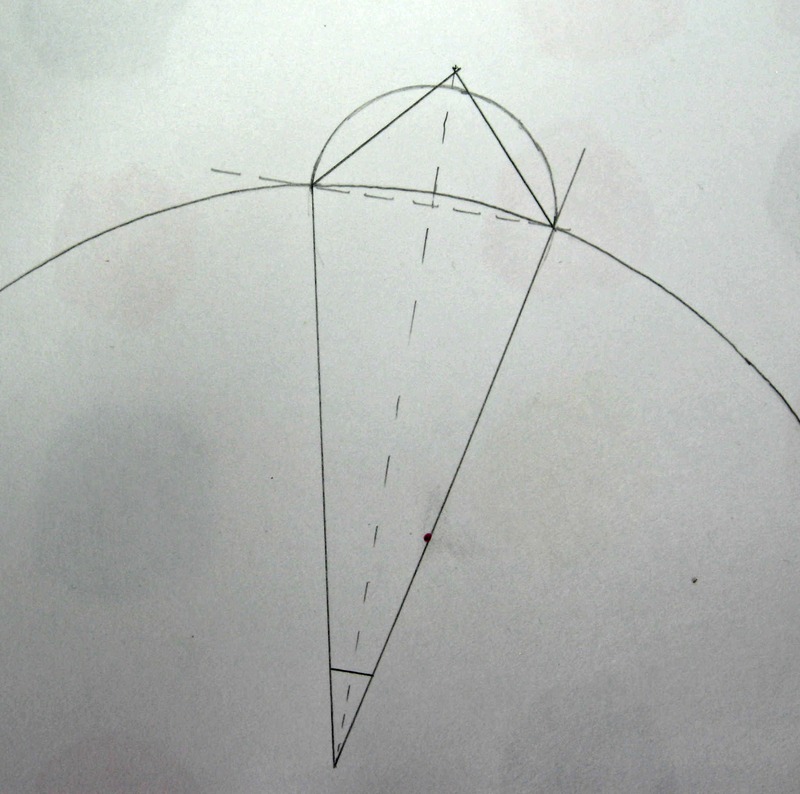 Using the compass, place the point of it on the centre point and the leaded end on one of the segment edges. Draw a half circle. This will give your plate a beautiful scalloped edge. Use the protractor to measure a line that will be 90 degrees to the central line in the middle of the plate segment. Draw straight across. If you prefer your Dresden plate to be pointed rather than scalloped, draw lines running through the points where the plate segment crosses through the circle. It’s up to you how pointy you make your plate. I measured up about 3 cms from where the straight lines crossed. Although I have drawn this on to paper, I would recommend drawing directly onto a piece of quilters plastic as it is more accurate than trying to trace it off from paper underneath. Once you know the size you are working with, it is easy to just draw a smaller section of the circle that you base your plate segment from. 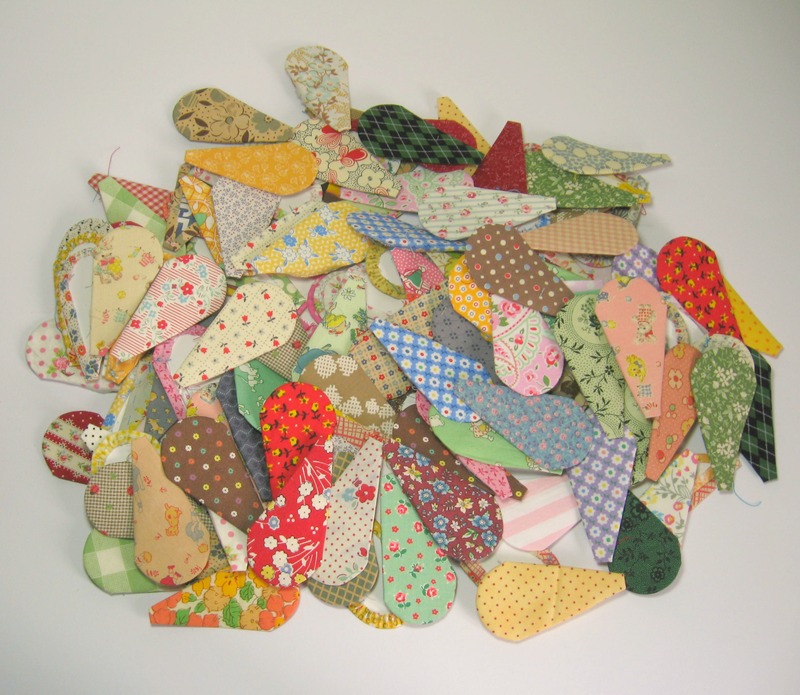 After a week of cutting out papers, and fabrics, then sewing the fabric around the paper shapes, I’ve finally got enough paper and fabric segments (I think) to finish making all the plates…. I figured I needed to stop making the plates individually (as I just want to keep using my favourite fabrics all the time), and arrange the pieces before joining them together. I’ve already sewn 9 plates together and I think I need 25 in total (I’m still a bit undecided about this but know I need at least this many)…….. after sewing the fabric pieces around the papers I just tipped out all the single segments into the middle of my work table, then spread them out a little to start playing around with which fabrics work well together. This isn’t always about what looks most complimentary but more about what looks good or striking together. Pink and yellow isn’t everybody’s cup of tea but it is a combination I love and will happily wear. As always when I’m working with scraps and favourite fabrics, I’m constantly remembering where particular fabrics have been sourced…. the above block contains 4 fabrics that my sister gave me when she had a huge sort out of fabric, a pretty floral green fabric that I want to use for a dress (currently designing that)… and a beautiful Lecien fabric that has tiny baby animals on it (this was the only fabric that I have bought a crazy amount of, half metres in cream, blue and pink….. probably my favourite fabric ever…. after the babbity rabbity fabric)…..
Sewing the fabric around the papers was a bit of a chore, but while I’m still at this stage it allows my mind to wander off and to think about how I want the quilt to look… from the layout of the plates to the pattern of the quilting…… the pink paisley fabric was from the best fabric bargain ever… a huge cotton quilt that I bought from a jumble sale for about £1.00. One side was paisley and the other was the same strawberry ice-cream pink but with tiny raspberry pink polka dots. 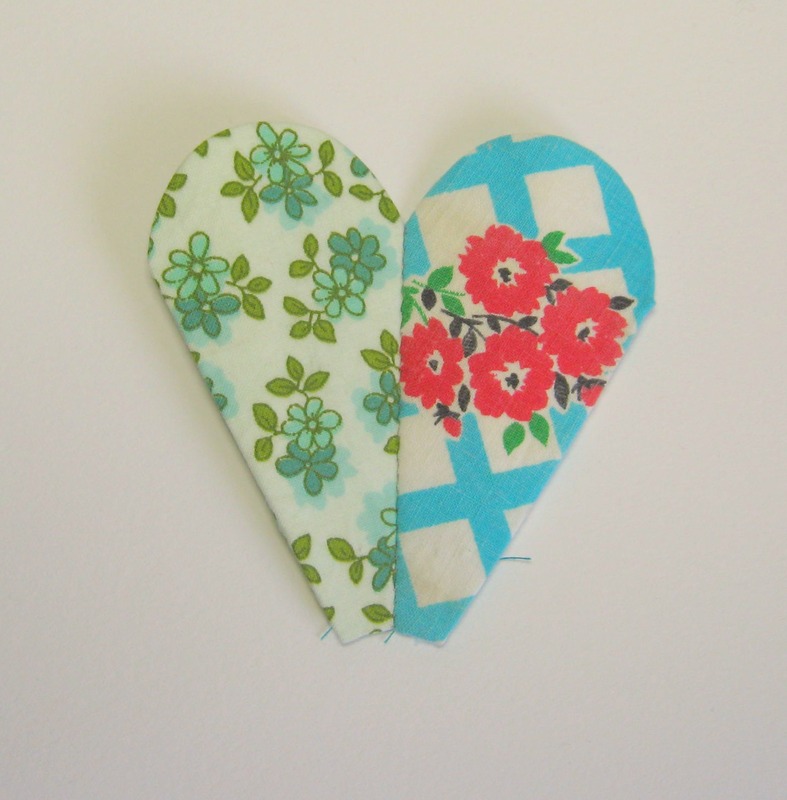 I’ve used it in numerous quilts and have also used it to make two super sweet little dresses for one of our nieces. 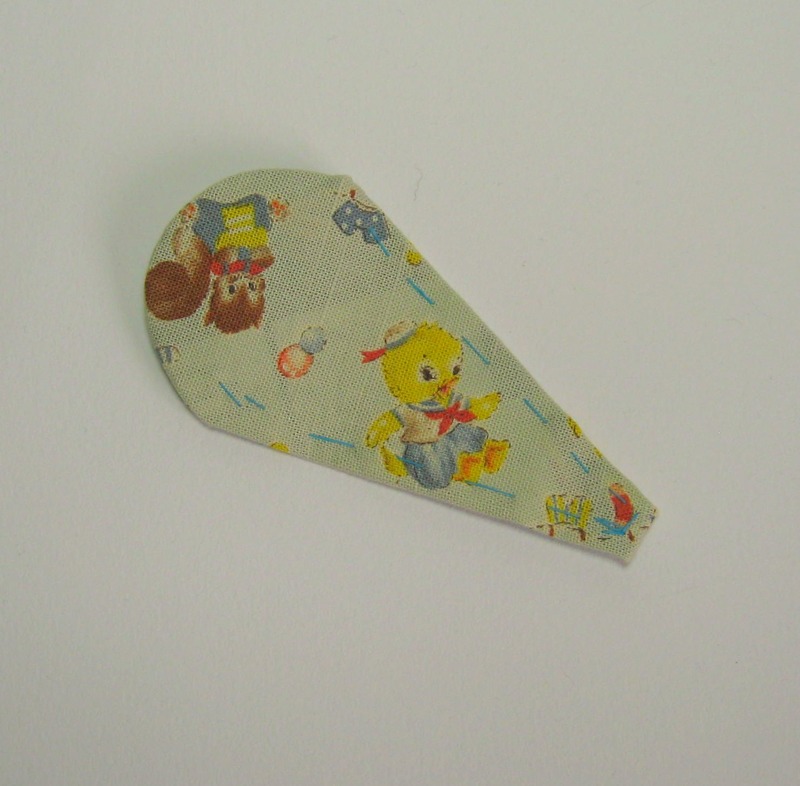 My beloved babbity rabbity fabric can be seen in a top segment. 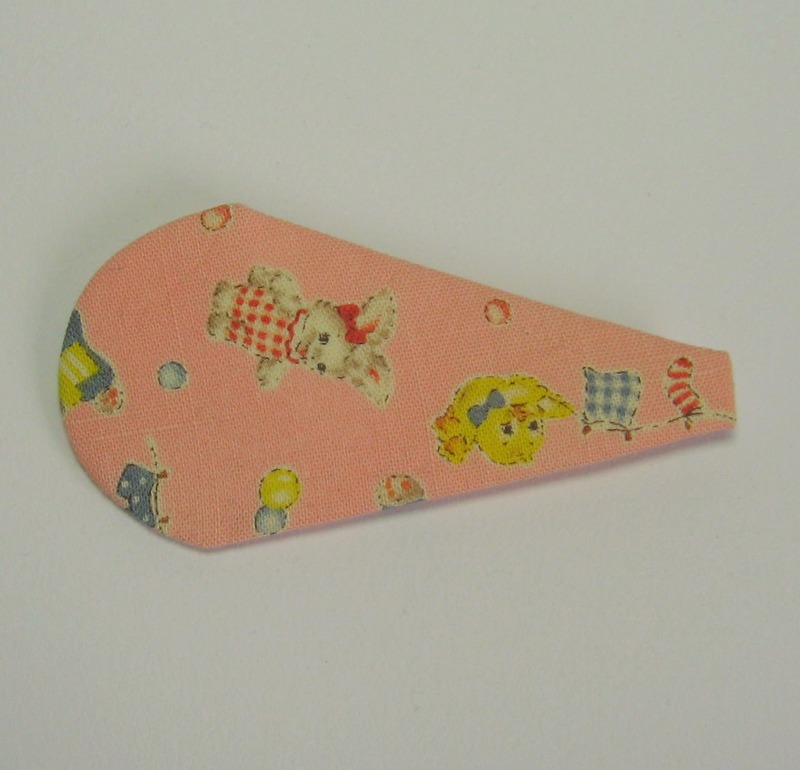 More yellow and pink……..the tiny purple print between the red gingham and the pink fabric was from a beautifully hand sewn dolls dress. The dress was all torn but was big enough to be able to trim off the hems and use the fabric. I liked it because the print was so tiny. Actually looking at these pictures I can see that I almost put the pink and yellow together yet again……. I really liked the peachy coral coloured fabric which is at nine o’clock (if the above plate was a clock)….. really wish I’d bought more of this fabric as I think it would have looked great as a blouse. I’ve used some brilliant little grips from Clover to hold the plate sections together…. 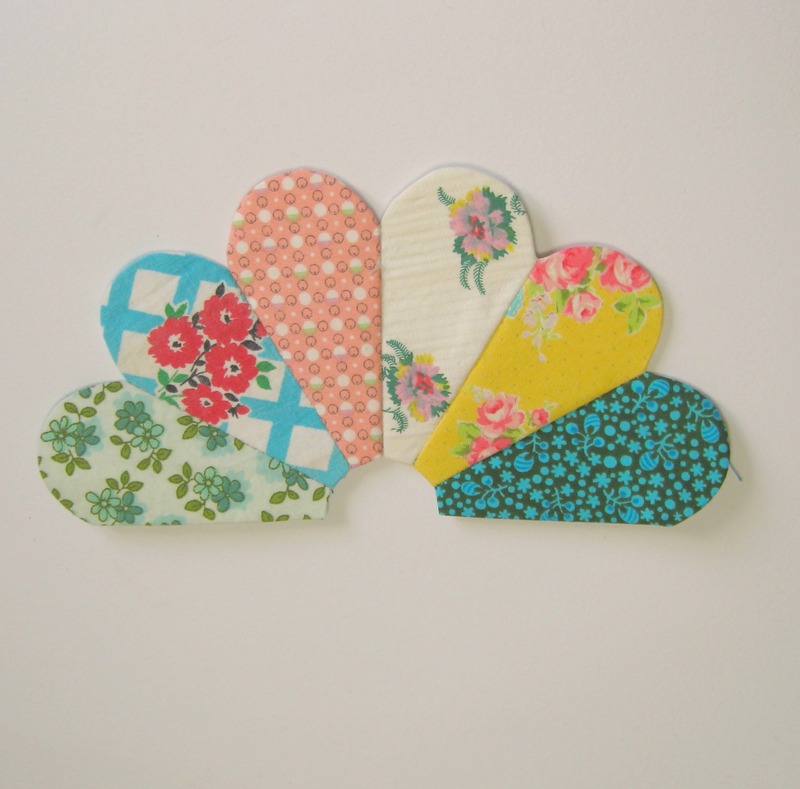 these are also good for holding two pieces together when you are whip stitching the fabric together…. 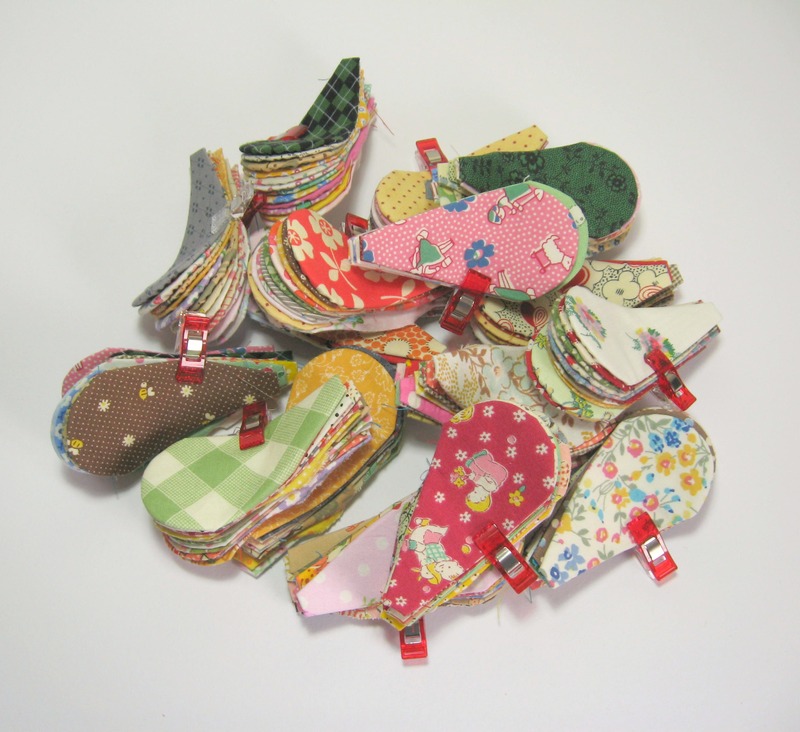 (the thin card I used for the templates is a bit stiff really for pins to go through easily)….. these are now all ready to squeeze into an already-full-of-other-sewing-I-need-to-get-on-with work basket……. 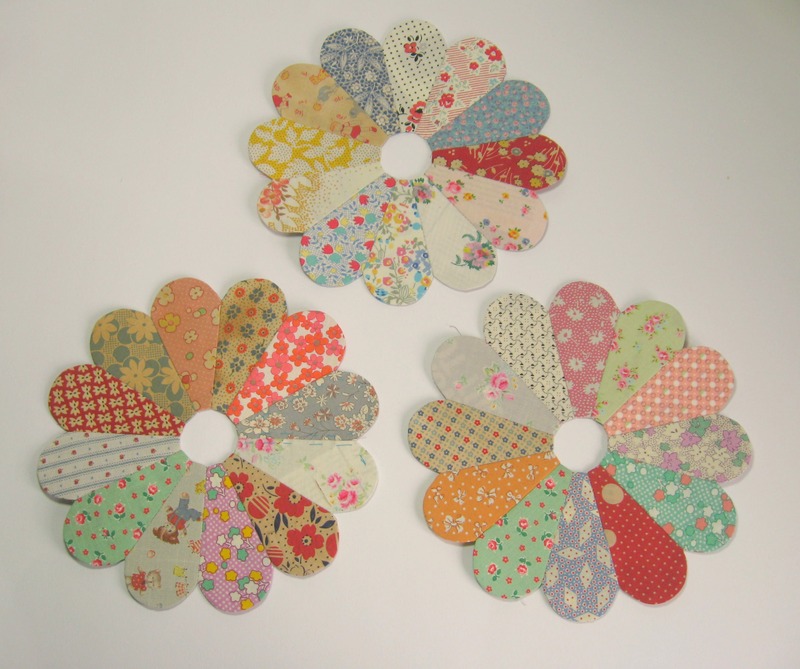 I’ve been busy sewing together more dresden plate blocks… cutting out paper templates and more fabric pieces. 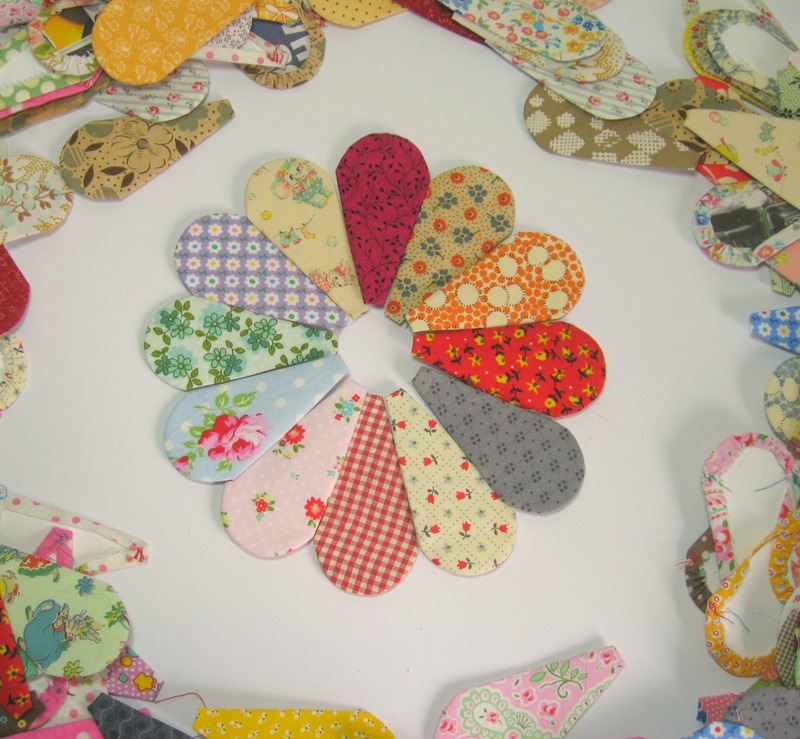 It’s fun mixing the fabrics and colours together, I’m trying to make sure each plate is made up of different fabrics. I’ve been using some of my favourite fabrics and have been able to mix in some fabrics from the huge stash my sister recently gave me. One of the things I like about the dresden plate block is how they look better when you really mix up the fabrics that are being used. Oranges and pinks, browns and blues….. Laid out like this they make me think of pretty plates that you hang on the wall……. I’m still a little undecided how I’m going to lay the blocks out, though I think I might use up some shirts I bought a few years ago to use as a background fabric. Piecing a dresden plate block is pretty simple. Arrange the pieces together in a pleasing mix of fabrics, the more the fabrics clash the more interesting the block will be when it’s all sewn together. Try to aim for a good mix of light and medium fabrics with a few darker or particularly brighter prints thrown in. Take two of the pieces and with right sides facing each other, pin them together. 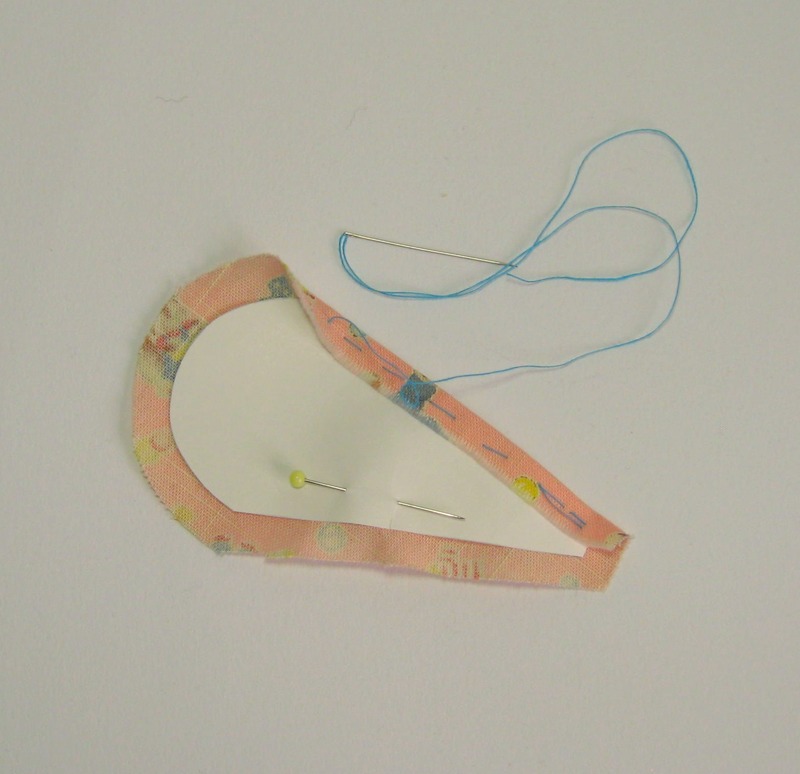 Using a “sharp” needle (the type you would use for applique), secure the end of your sewing thread through the fabric only. Try to use the best sewing thread you can. Grey thread or light brown will blend in best with your fabrics so the stitches aren’t so noticeable from the front. 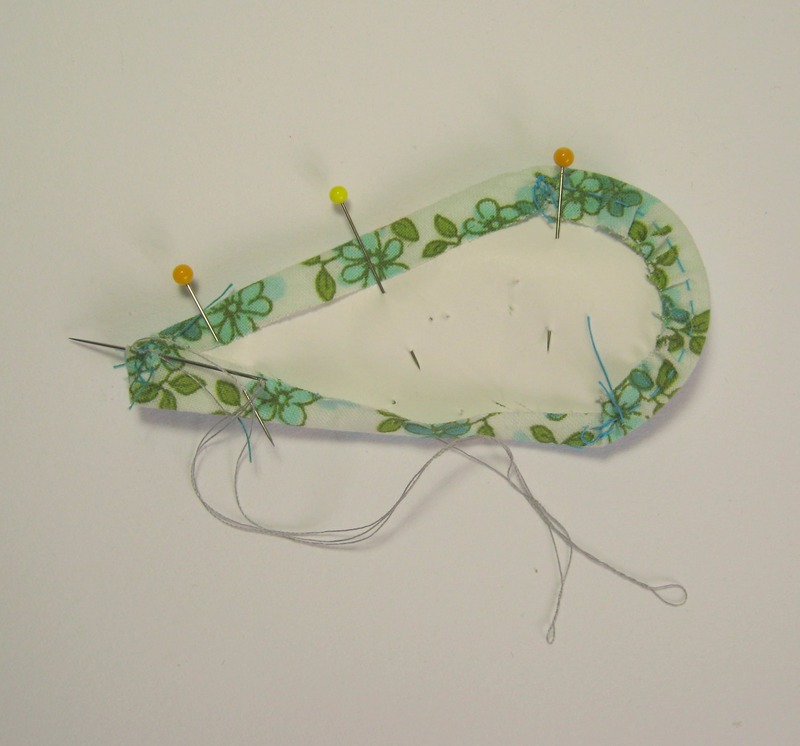 Holding the two pinned pieces together, insert the needle straight across the pieces only through a small amount of the fabric. 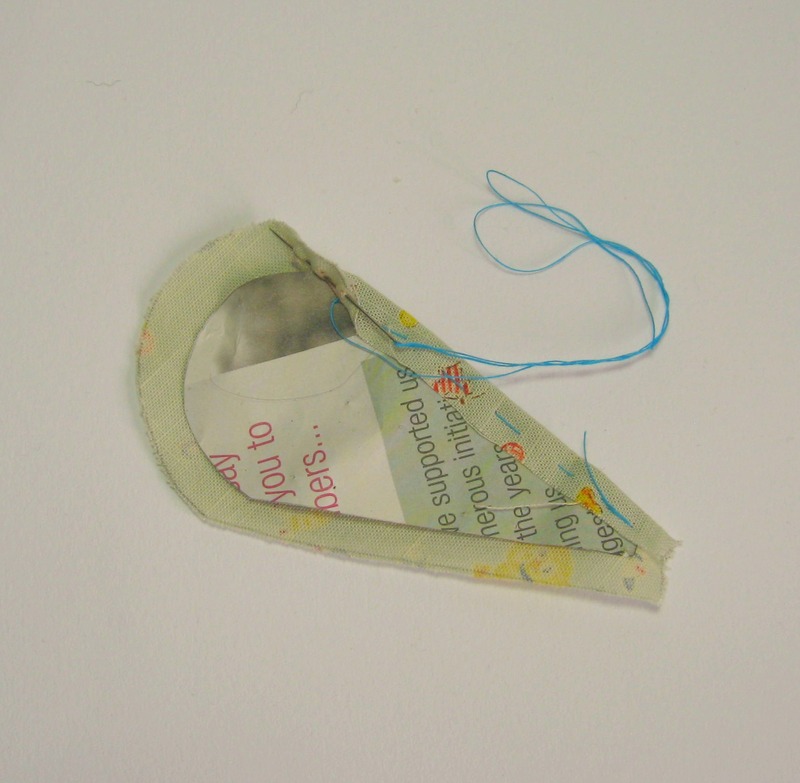 Don’t sew through the paper. Keep working up along the edge of the two pieces. It’s a bit like tracing the steps up a ladder. The stitches form tiny diagonal lines. 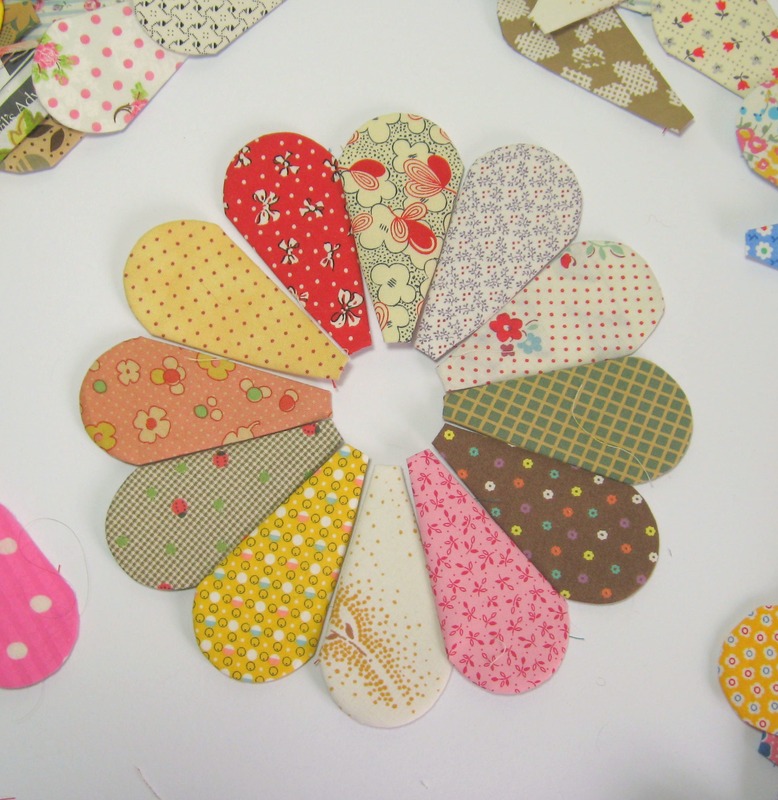 It’s tempting to sew your stitches very close together, you really don’t need to sew them too close, when you have sewn a few stitches you can run your fingers over the flattened pieces, it should feel smooth. If you can feel a bit of a ridge then you are sewing the stitches too close. When you get to the top, make a few stitches to secure the thread and trim the thread. From the front you shouldn’t be able to see your stitches. 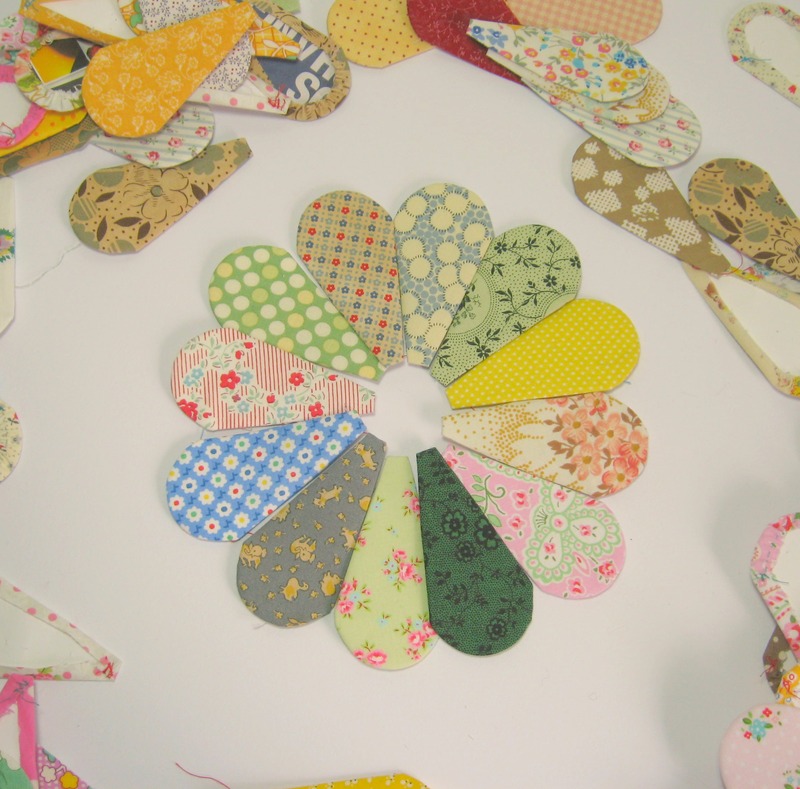 Sew the next section in the circle, just the same as you’ve sewn the previous piece. 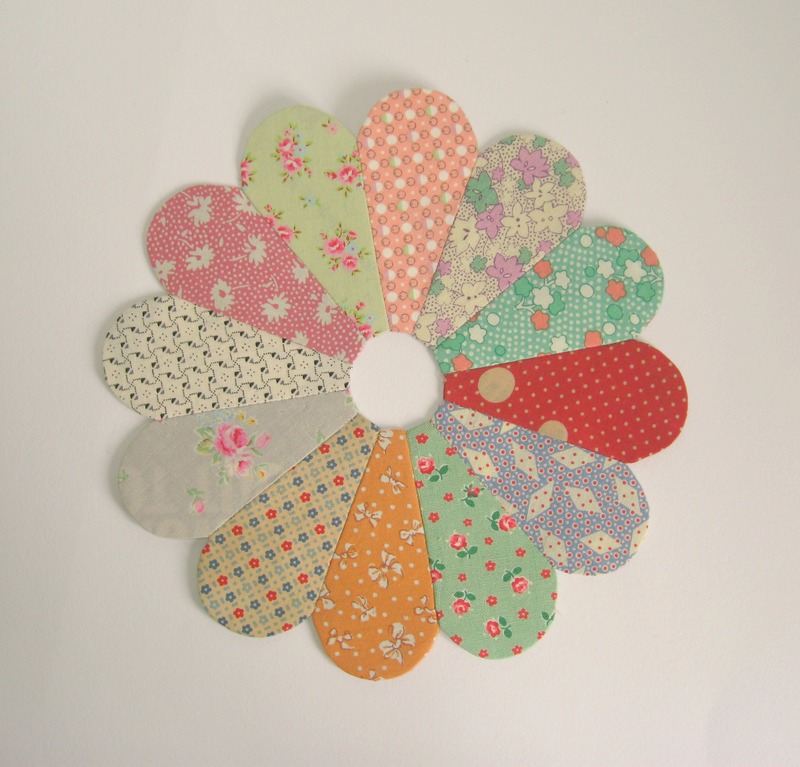 Keep sewing sections until you have a half circle of 6 pieces. Repeat with the other pieces that make up the second section. Pin them on top of each other and whip stitch them in to place the same way as you’ve seen all the other pieces. 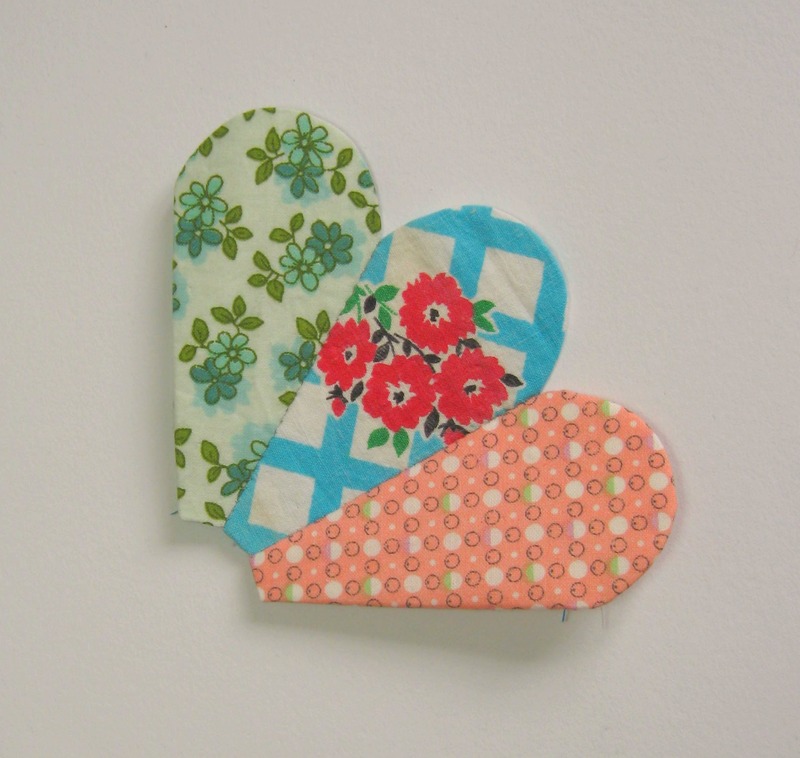 When the “plate” block is finished, give it a light press with a hot iron to flatten the patchwork. 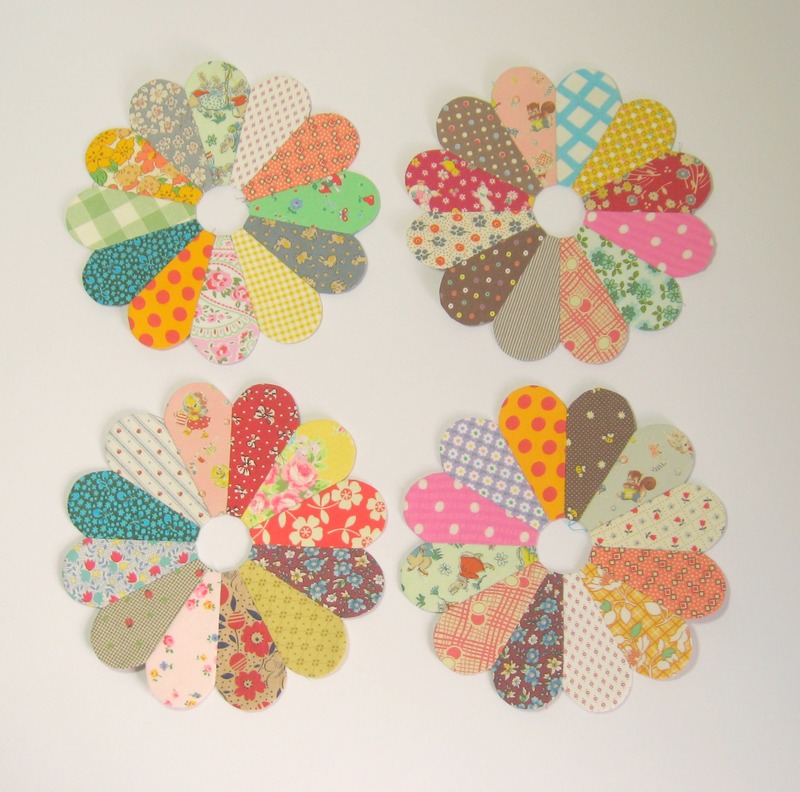 As I’ve said before, the dresden plate is one of my favourite patchwork patterns….. it always looks bright and cheerful and it’s a proper old timey patchwork pattern. This is a tutorial to show the way that I prefer to sew the pieces which make up the plate block. It’s a little bit different to the method I wrote about yesterday. Each block requires twelve pieces. (Okay some times the pattern will require more, but this one uses twelve)…Place the paper template in the centre of each piece of fabric. Pin the paper template into place to stop it wiggling about. Secure the end of the thread with a few back stitches at the start of the curve of the fabric. Sew a line of tiny, evenly spaced stitches along the top of the curve of the fabric, gently pull the thread to gather the fabric over the curve of the paper template so the fabric hugs the paper underneath. 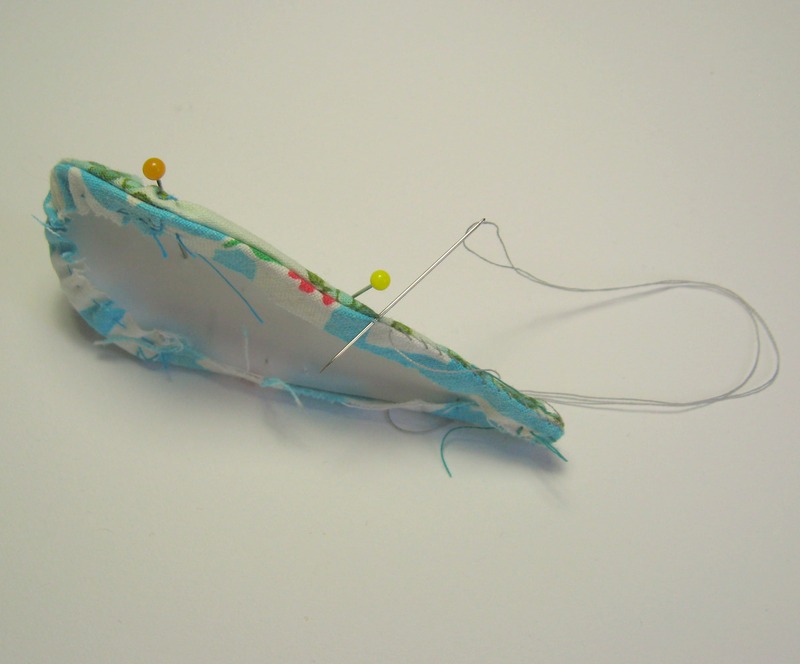 Insert the needle through the layers of fabric and make a few stitches to secure the thread which will keep the gathered fabric in place. 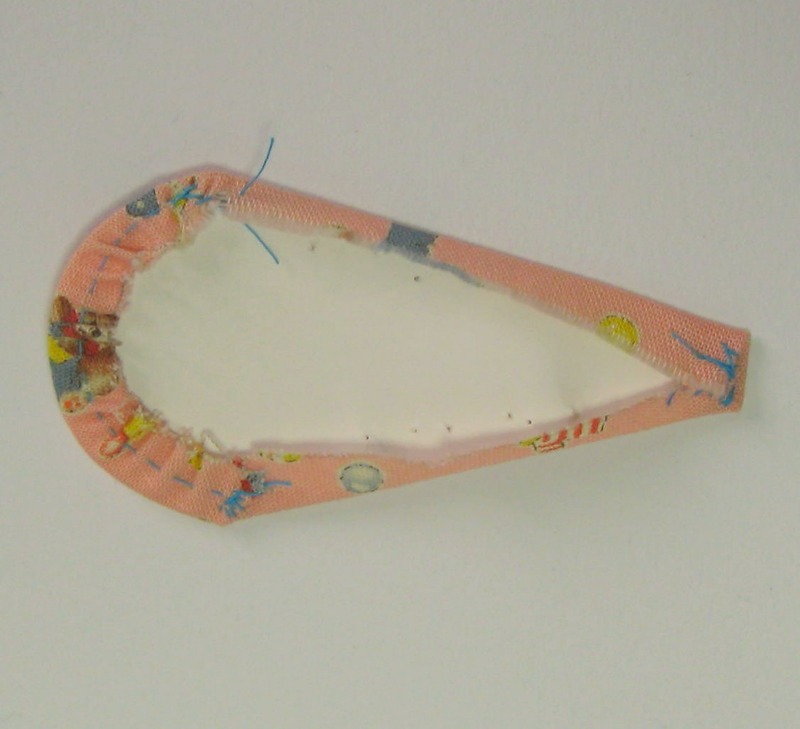 Make sure you don’t sew through the paper and are only sewing through the fabric. This is a lot easier than it sounds. 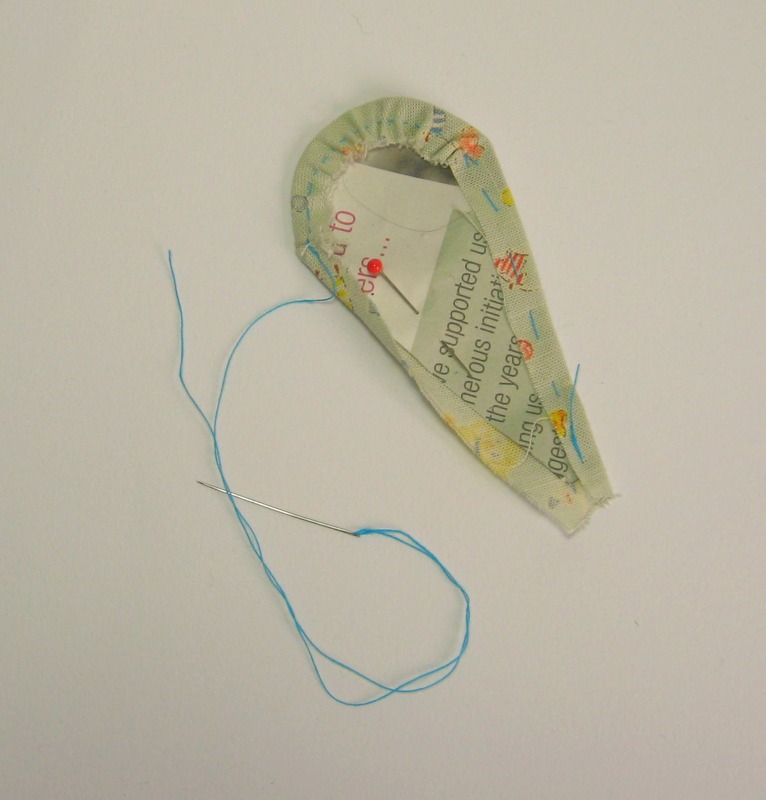 The needle will pretty much want to sew through just the fabric rather than through the paper as well. Trim the thread. 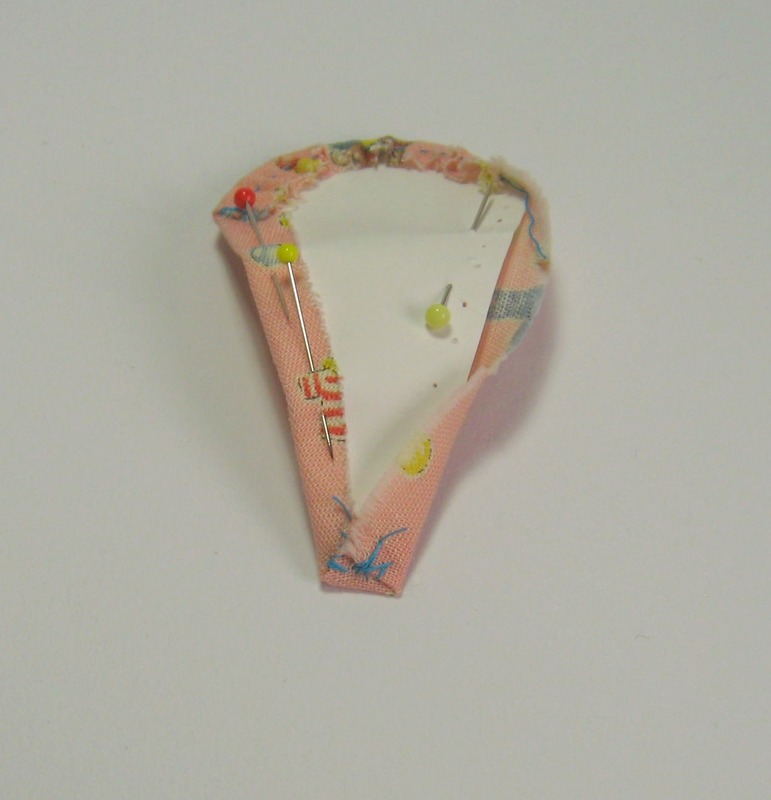 Pin the sides of the fabric over the paper template, turn up the bottom of the fabric and sew securely into place. Make sure the needle doesn’t go through the paper but only through the fabric, after a couple of stitches, sew the other side of the fabric into place. Trim the thread. The fabric should feel nice and secure around the bottom of the template. Bring the other side of the fabric over the paper template and with a couple of stitches, secure the top of the fabric so that the gathered top holds the template into place. If you feel the fabric at the sides seems a bit loose, then you can pin it to keep it’s shape until another side piece is sewn to it. These pieces are about two 3/4 inches long and I don’t find they really need the extra pinning if you give the fabric a little press with your thumb. 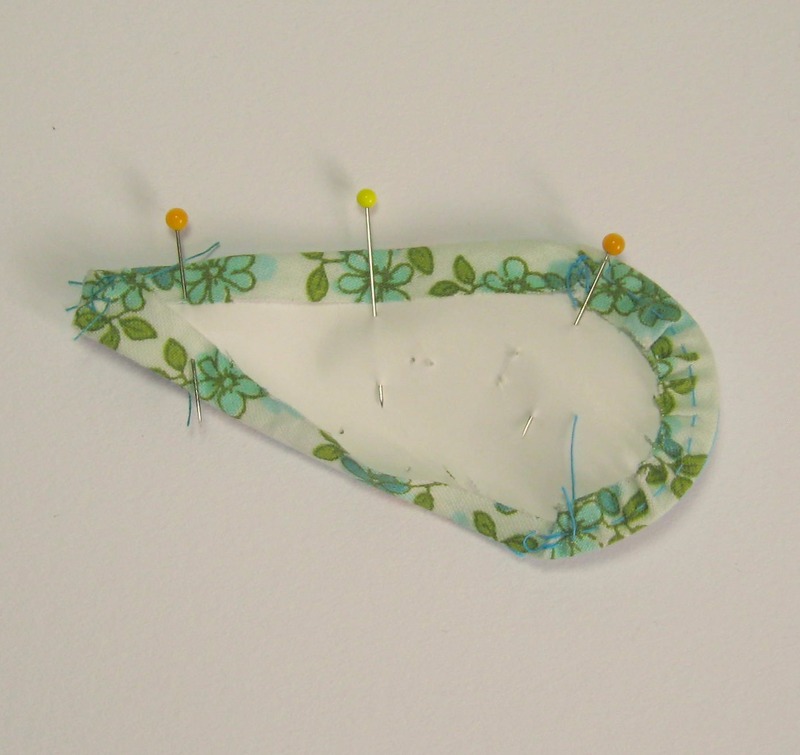 If the pieces are particularly long then you may prefer to pin the sides. When you turn the patchwork piece right side up, you won’t see any of the tacking stitches. Sew the sections together with a small neat whip stitch. When your ” plates” are all finished, applique the patchwork on to fabric. 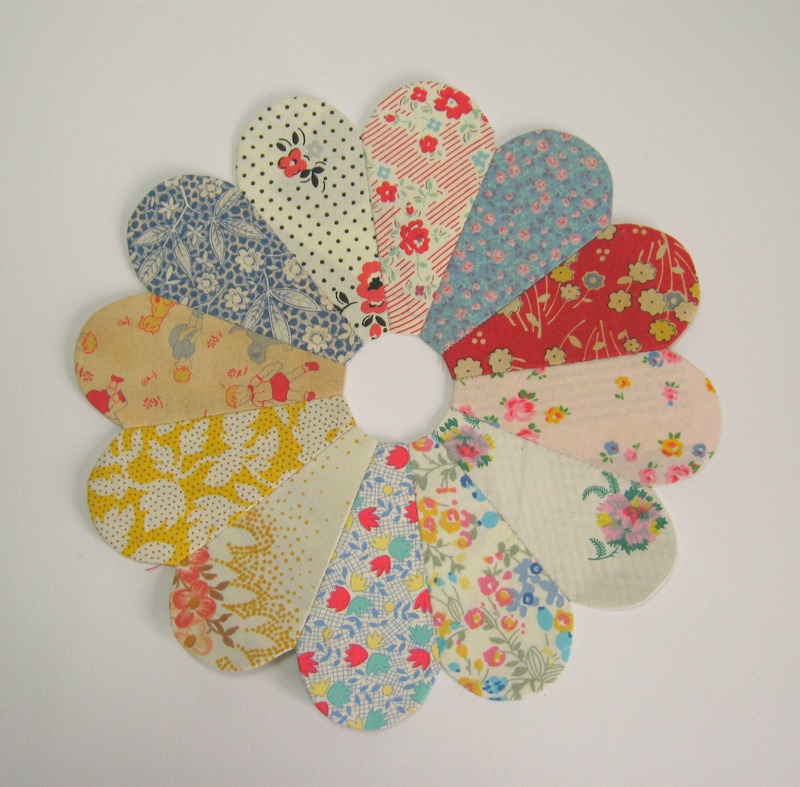 To remove the papers you will firstly need to cut the backing fabric away, leaving a generous one inch seam allowance on the inside of the circle. 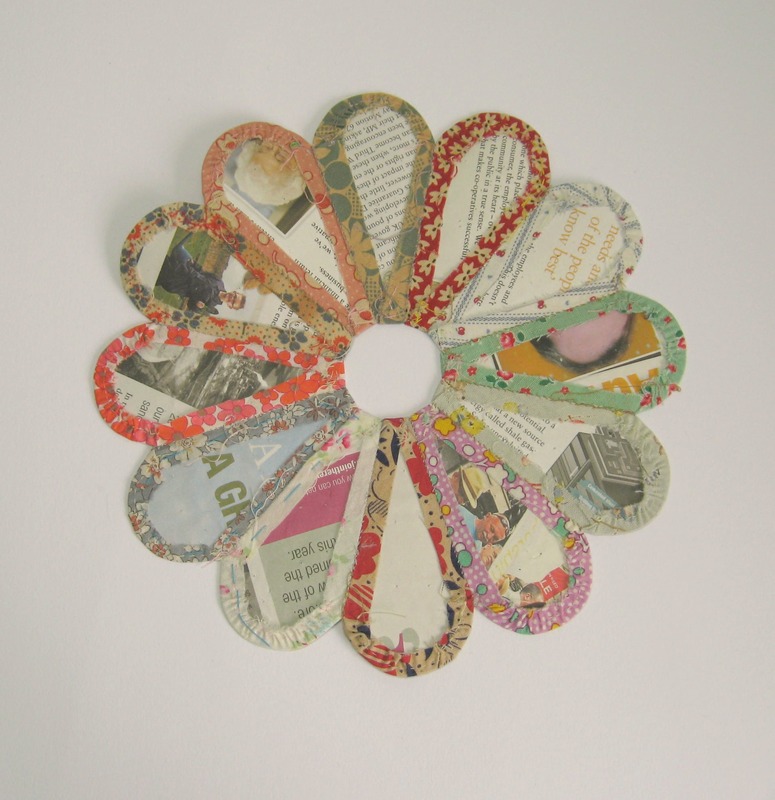 The paper pieces are really easy to remove and can be reused. The tacking stitches, such as they are, are left in place and I find they seem to add a little more structure to the patchwork when they are worked this way. 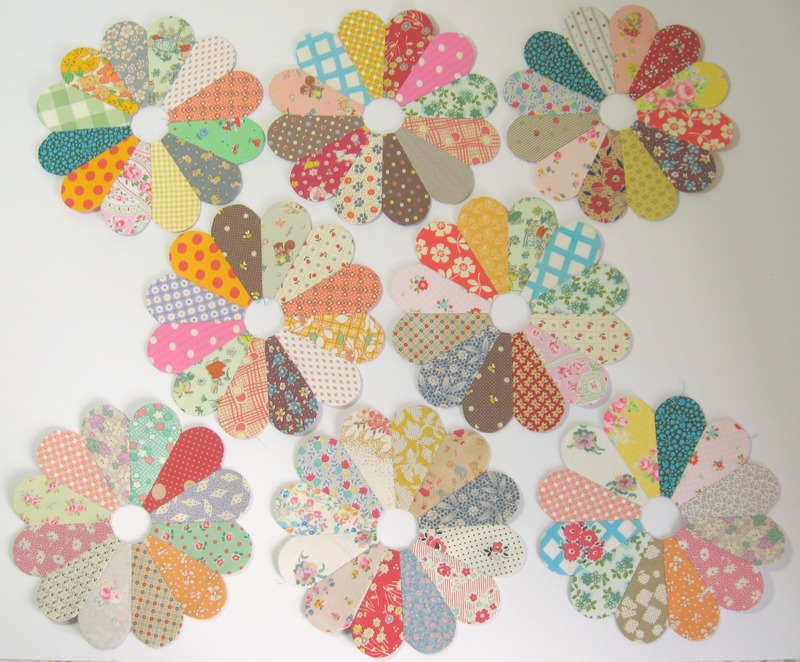 This is the way I prefer to sew most of my paper pieced patchwork such as hexagons. I don’t like sewing through the papers, partly it is a bit of a pfaff to have to unpick the tacking stitches, but by tacking just through the fabric, I find the patchwork shape feels more secure, and has a bit more structure to it. 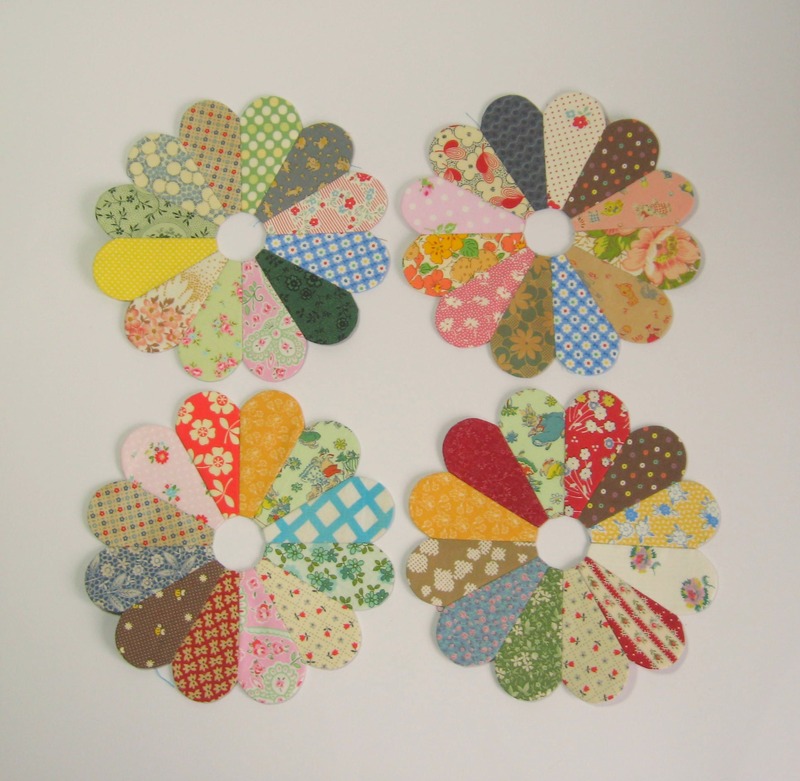 The dresden plate block is a little bit fiddly but is lovely and cheery when it’s all sewn together. 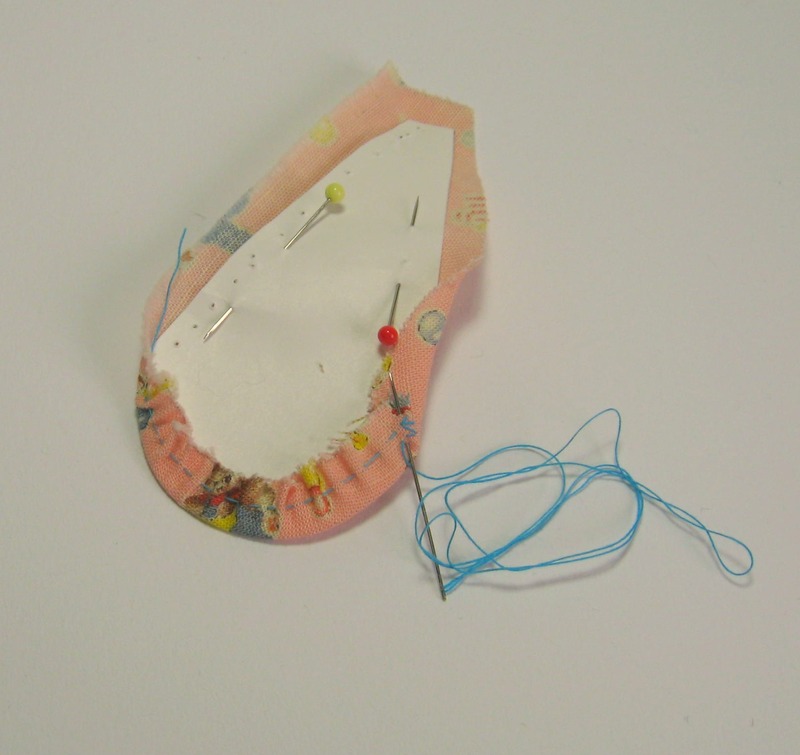 This is a simple tutorial for sewing the separate pieces over papers that are then joined together to make up a circle or “plate”. 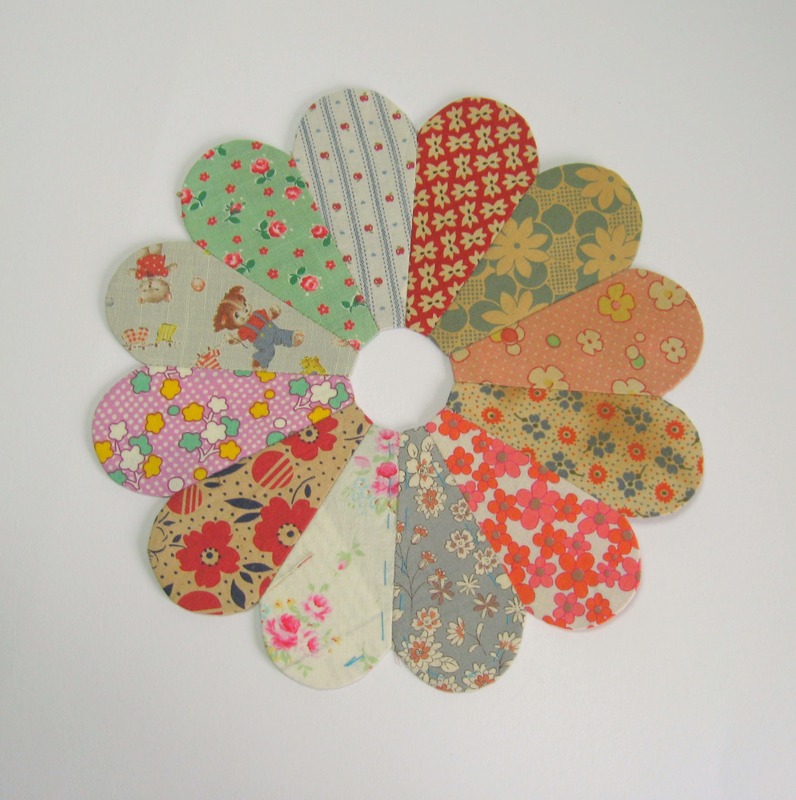 Cut out as many papers as are required, and cut out your fabric with a generous 1/4 inch seam allowance all around. 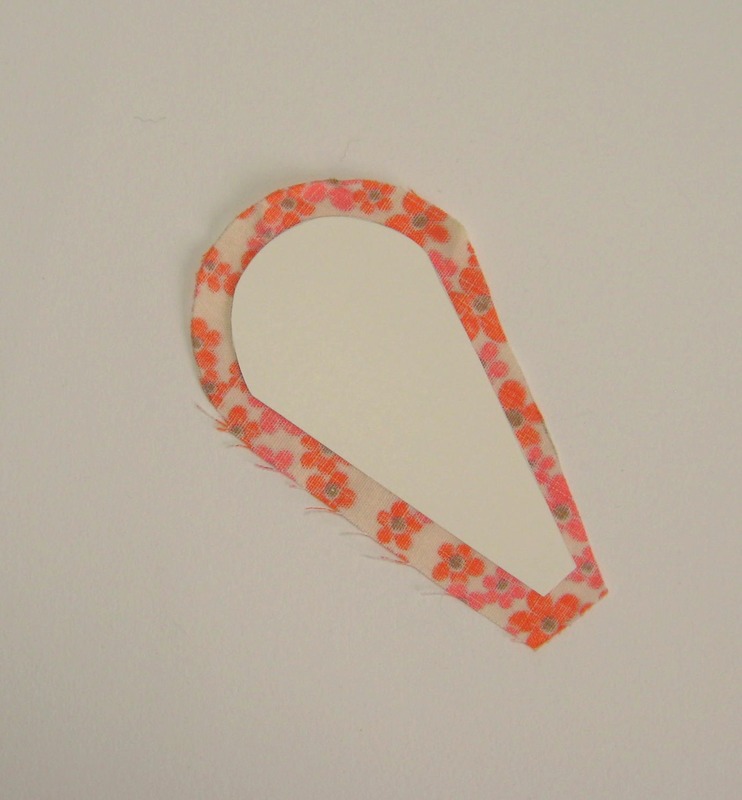 Tack the paper template to the fabric… make several small backstitches, and then sew a small running stitch up to the top just before the curve starts. 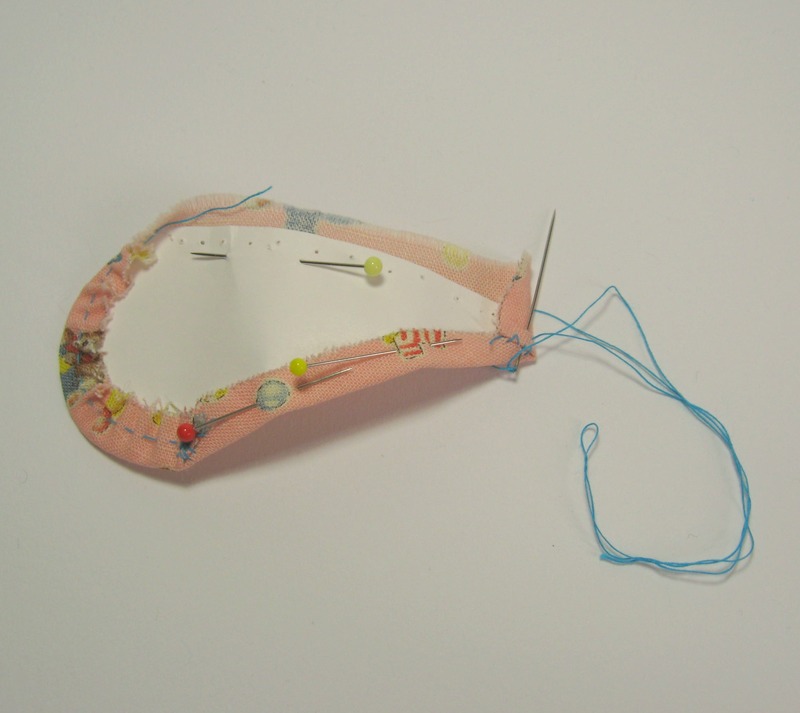 At the top of the line of running stitches, take another back stitch to secure the thread. 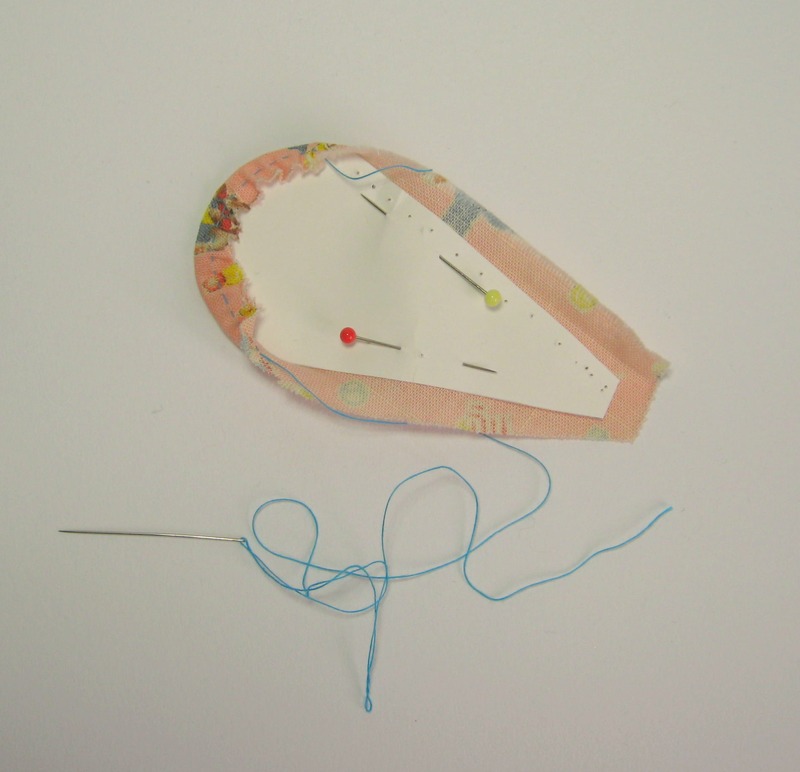 Insert your needle into the start of the curve and sew a line of tiny running stitches. It’s best if you can keep your stitches as small and regular as possible. 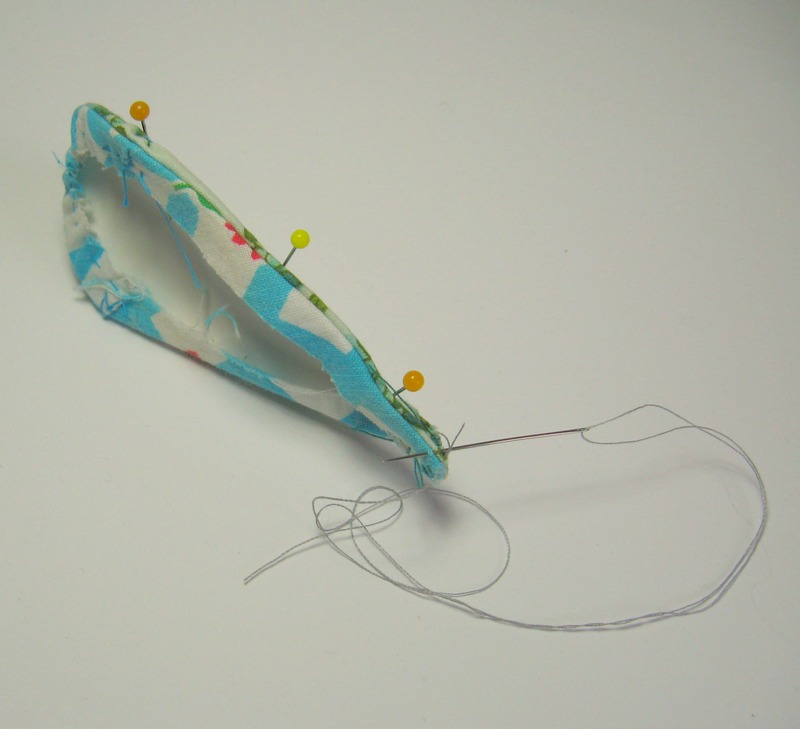 Gently pull the thread so the fabric gathers, secure the thread with a couple of small stitches through the fabric. 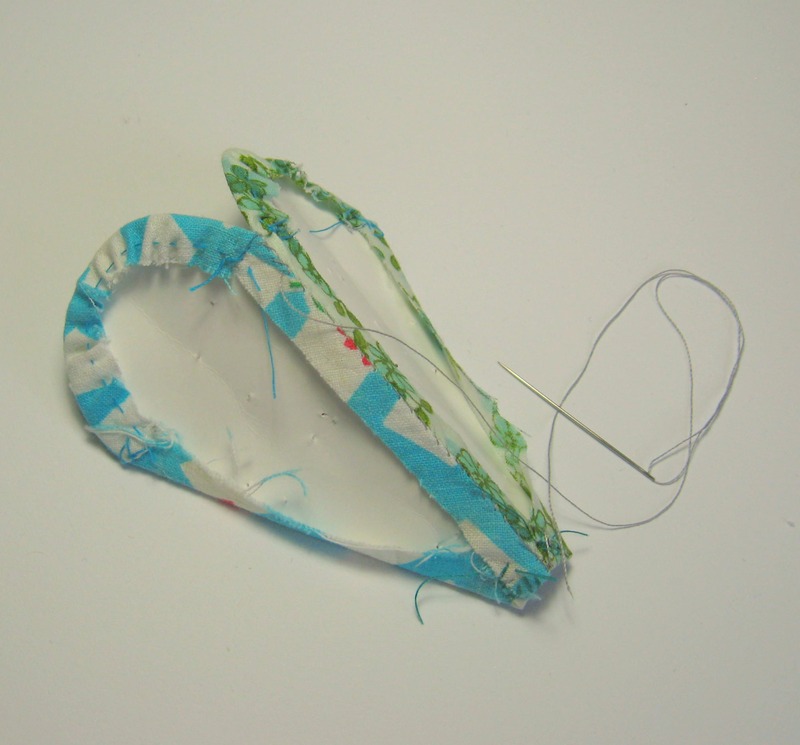 Continue sewing along the other side and secure the edge of the fabric piece over itself sewing each end securely. When you turn the piece over you can see the stitches that hold the paper into place. The pieces are then sewn together with a small and neat whip stitch. When your plates are all finished, applique the patchwork on to fabric. 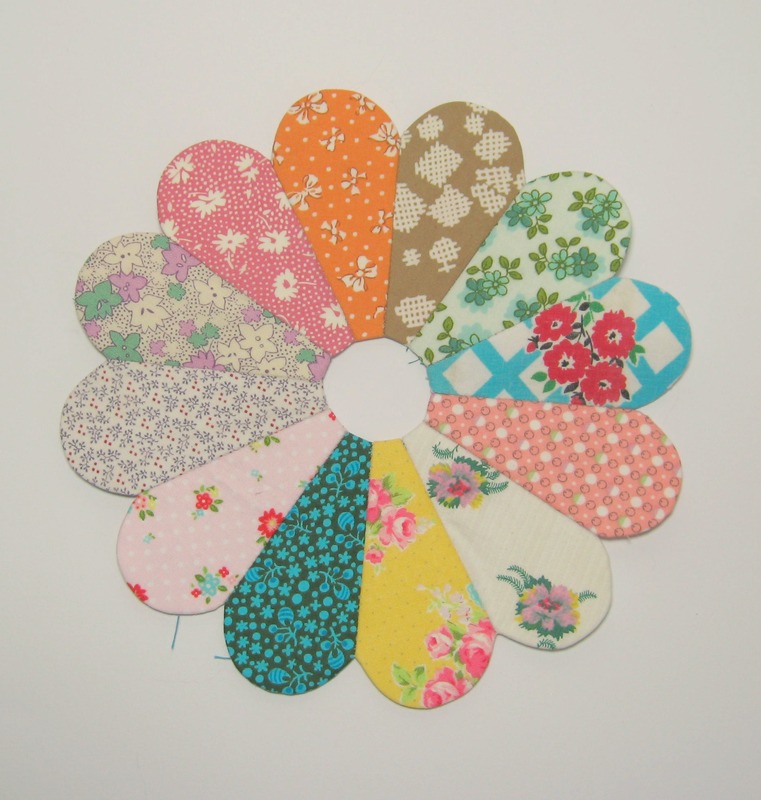 To remove the papers you will first need to cut the backing fabric away, leaving a generous one inch seam allowance on the inside of the circle and then unpick the the tacking stitches so the papers fall out. 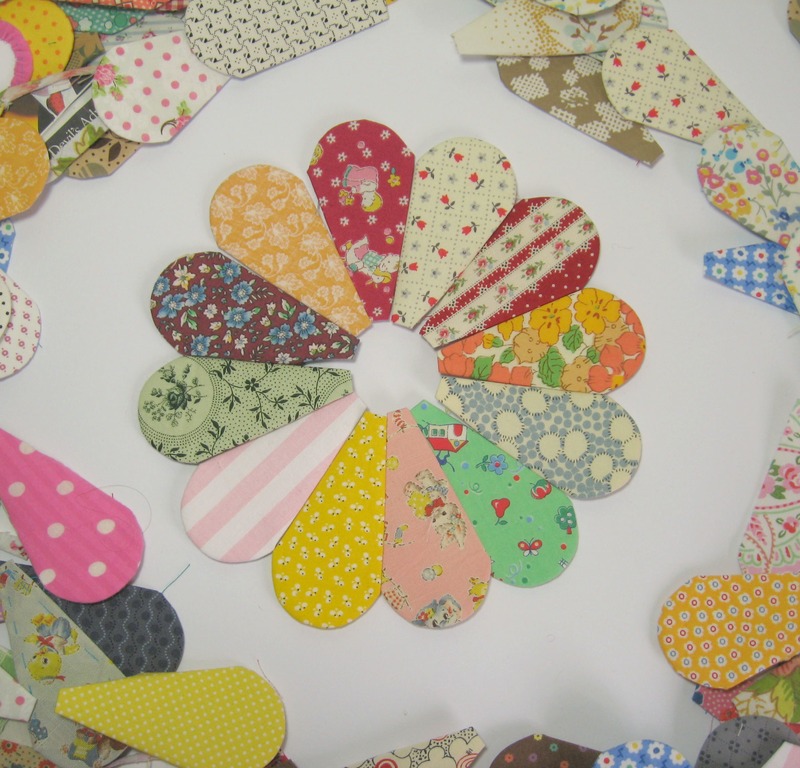 Although this is generally seen as the most popular technique, sewing the papers to the fabric means you have to remove the tacking stitches as they are visible from the front of the patchwork. 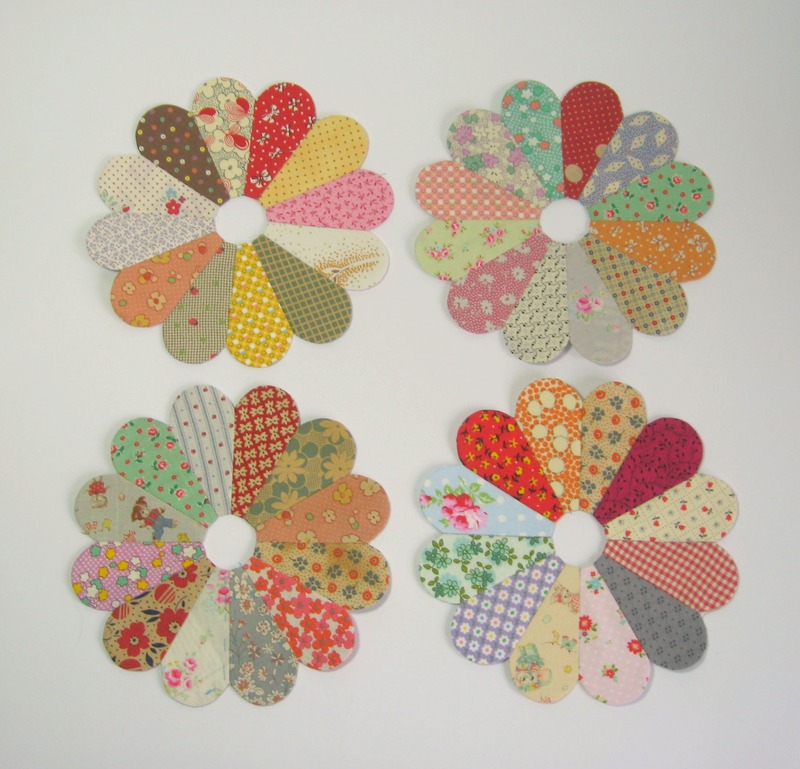 One of my favourite patchwork patterns is the dresden plate block. There are a few variations around but I think my favourite is the one with the rounded top. 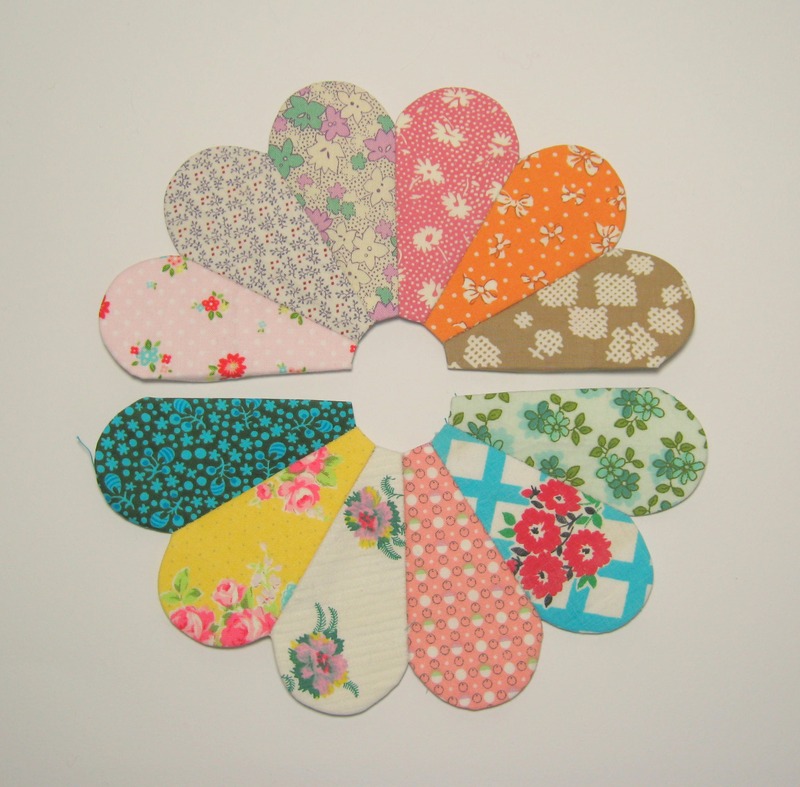 It’s such a cheery smile inducing patchwork, and when made from vintage themed fabric looks beautiful and homey. Sewing the pieces together is a bit fiddly but I think it is well worth the effort in making. 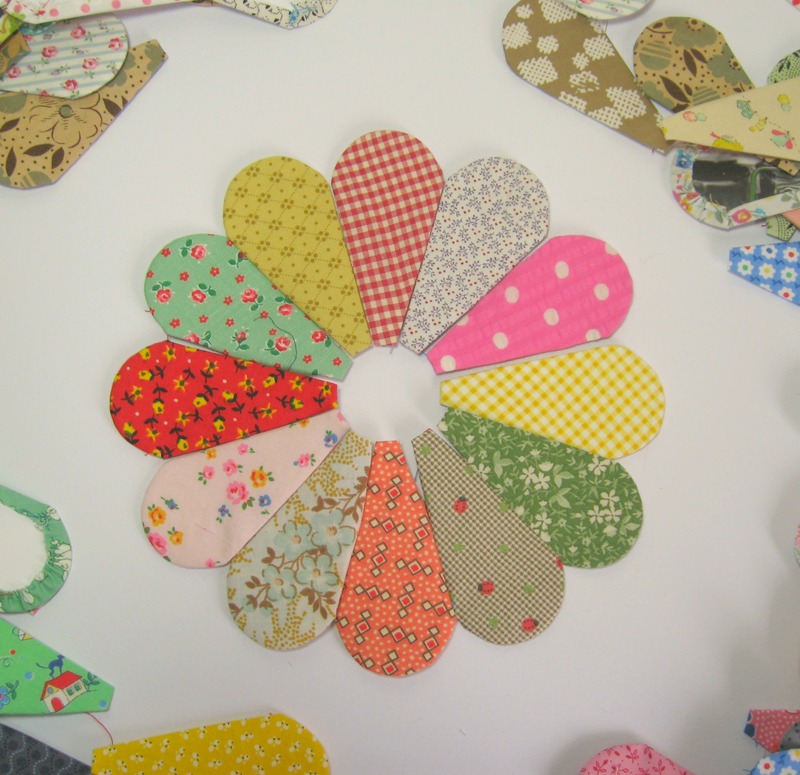 It’s good for using up small scraps of fabric (the pieces in the above patchwork are sewn from pieces about four and a half by two and a half inches) and if you make your own clothes, then those odd shapes of fabric are ideal for this. I originally made these templates a couple of years ago but then stored the papers and fabric away and pretty much forgot about them. 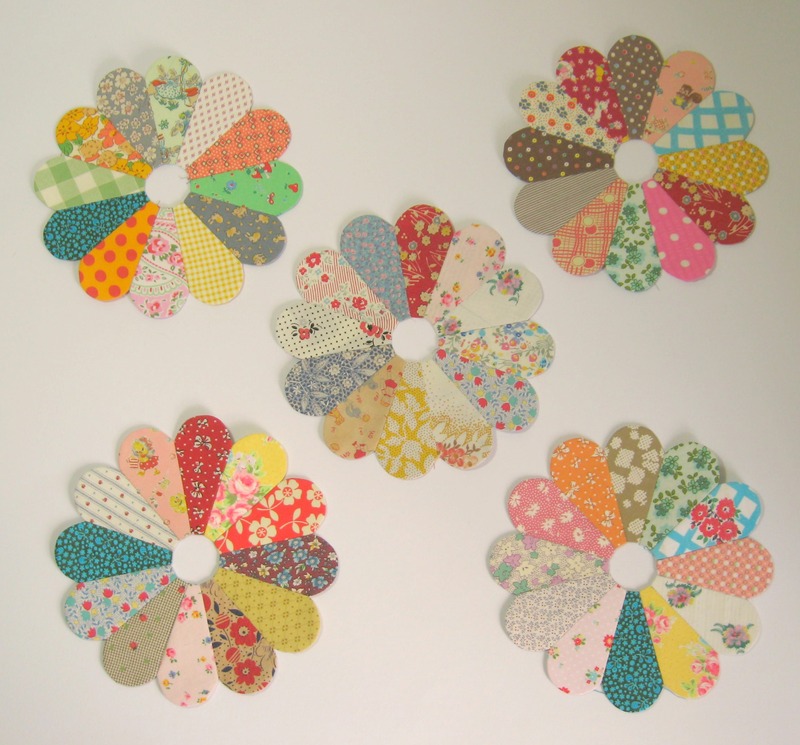 I re-found them again a few weeks ago and have spent the last two days sewing them up into circles (or plates)…. I’ve not sewn the fabric to the papers but instead fitted the fabric tightly around the corners so the papers can be easily popped out when I’m sewing them into place. 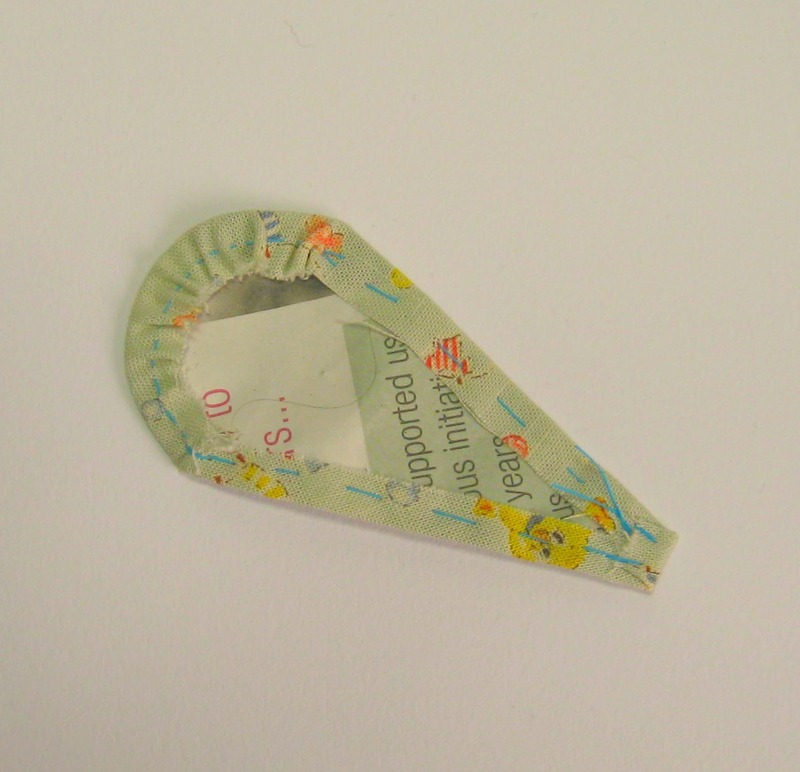 Leaving the papers in when sewing really helps to keep the shape at the top nicely curved. 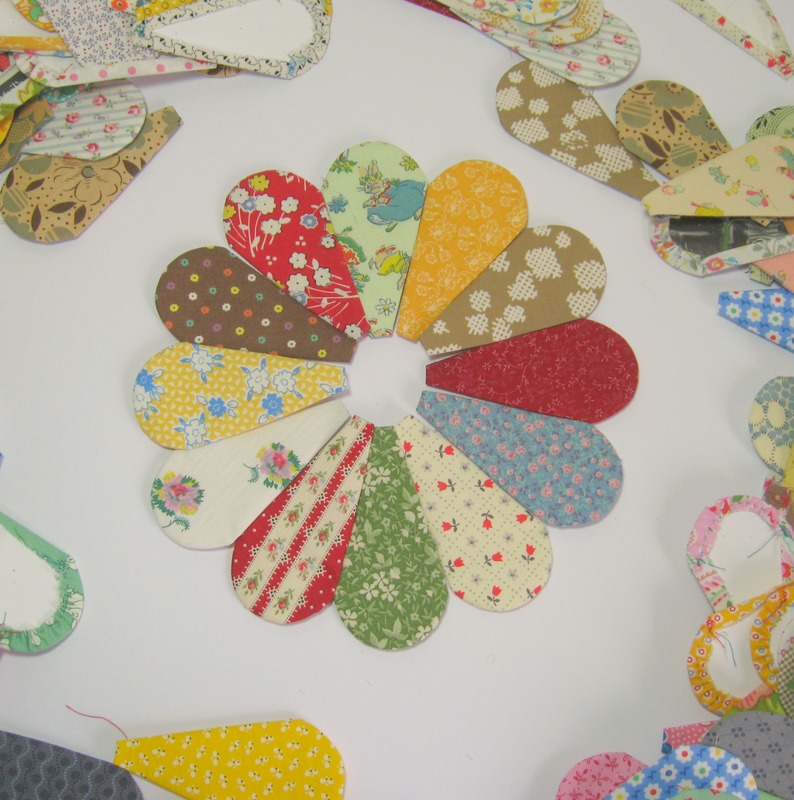 I’ve sewn three circles so far…. each one is about eight and a half inches wide. 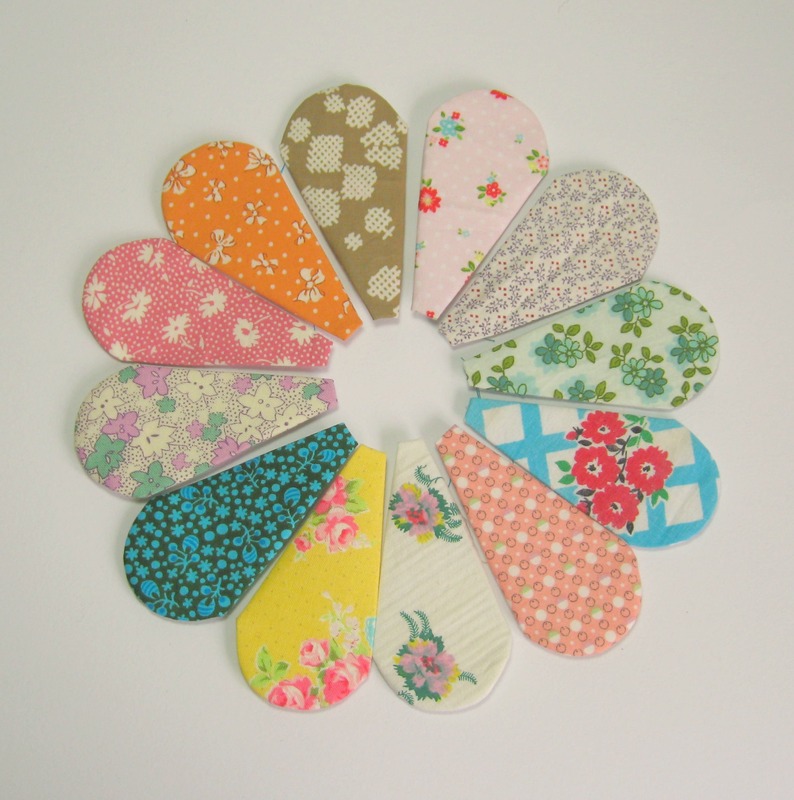 I’m not really sure whether to make 16 or 25 in total, I’m thinking of using them to make a small quilt for the back of our sofa, near to hand if it gets a bit chilly in the evenings (and no doubt ready for Bernard to curl up and sleep on).